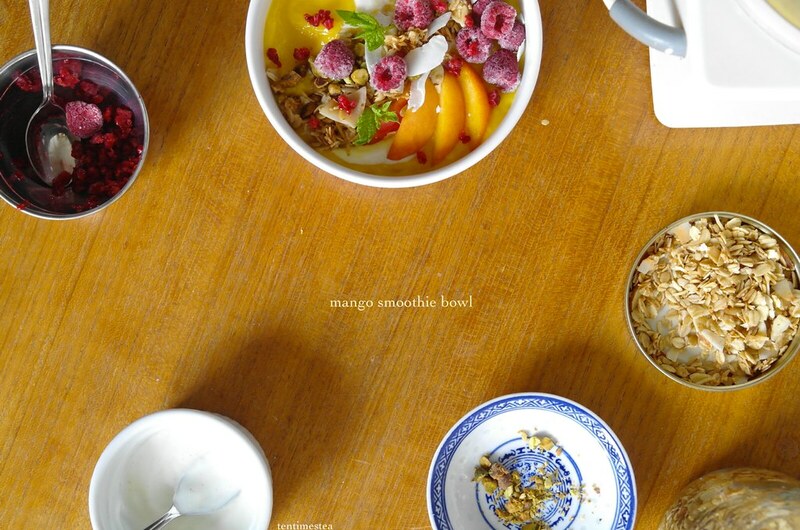 The first time I heard of smoothie bowls, I thought it sounded a bit gimmicky. How is this different from a normal smoothie? Why does putting it in a bowl all of sudden make it so hip and Pinterest-able? Despite my confused yet placid disinterest, my friend, with an enthusiastic and generous love for smoothie bowls derived from some time in California (apparently a smoothie bowl hub), decided we must have one. 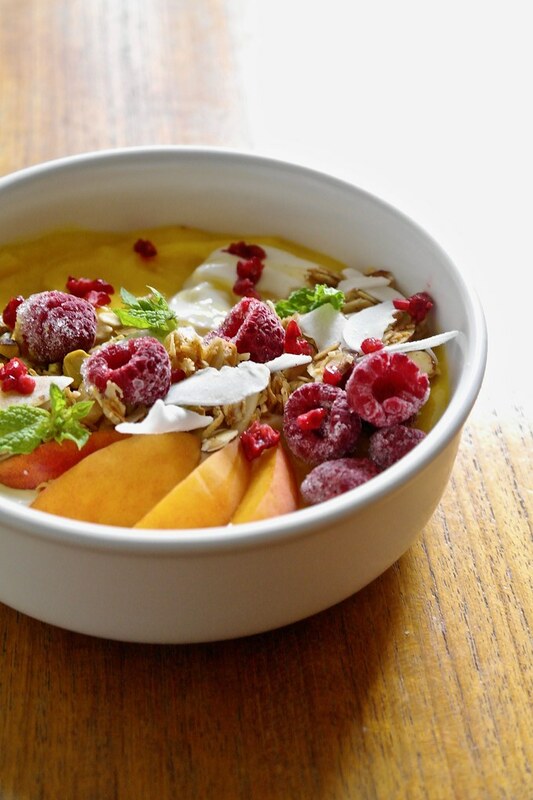 After he ordered this smoothie bowl from this smoothie chain, in a transforming manner kind of like macarons, everything came together and all the hype made sense. Because it was thick and satisfying and you like ate it instead of drinking it. 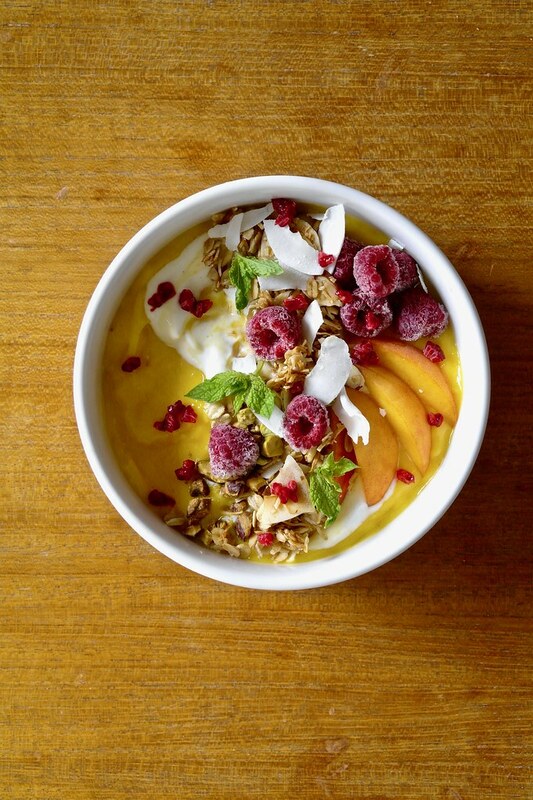 And it wasn’t just that having an array of toppings on your smoothie bowl was pretty, but that it added textures! and different flavours! and different combinations of flavours! and it’s simply a pragmatic matter of surface area to explain why you need to put your smoothie in a bowl to achieve that number and variety of different toppings. 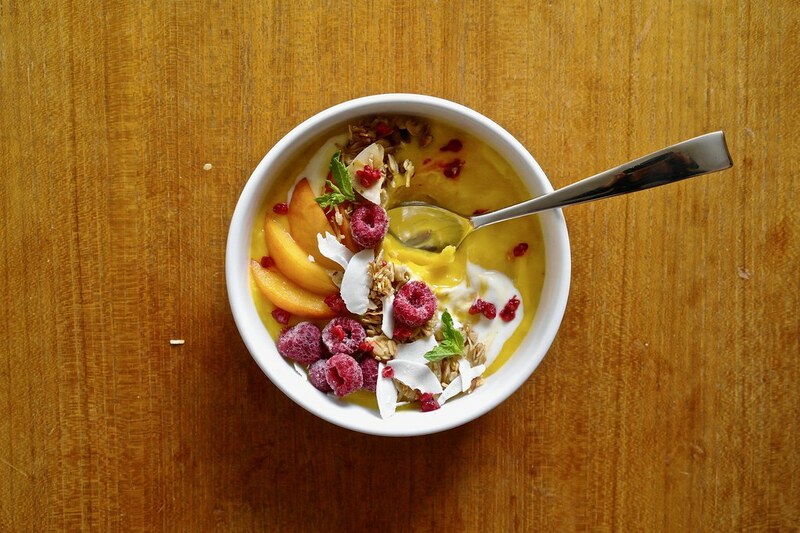 And no, my former self, no, a smoothie bowl is not just pouring a smoothie into a bowl. 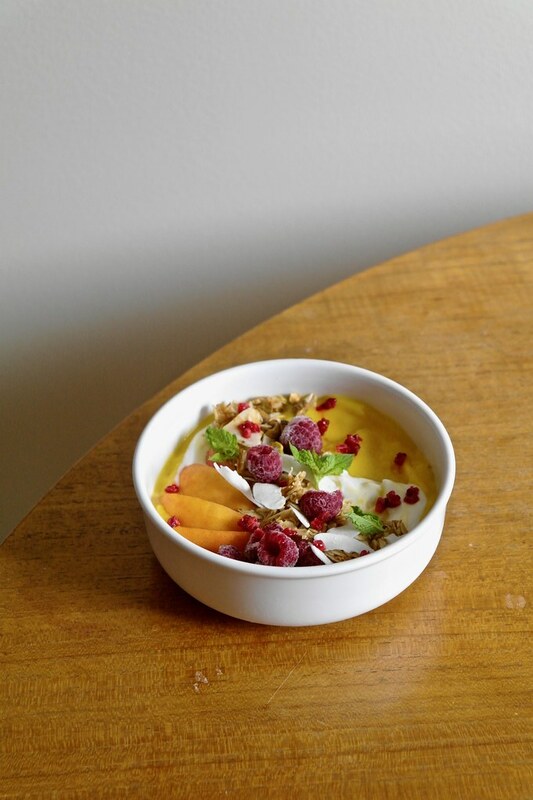 Okay, well, I mean, actually it still kind of is, but I would argue that there is a small key distinction in that you should have to scrape a smoothie in a bowl (this may be a point under debate, but I do prefer the scrape-able texture). Another smoothie related-discovery happened a couple summers ago, when I had learned how to make thick smoothies from my half-sister’s half-sister. She would combine frozen fruit in a food processor to make a thick smoothie that would be scraped into a cup and eat like ice cream. What possible reason is there to make a thin anemic drink when one can use the same ingredients (just a bit more frozen) to make a thick erythrocytic marvel? it’s soft-serve sorbet. for breakfast. Before I let you go, I will squeeze in one more drawn out aphorism between this picture and recipe. Because sometimes these small things can remind us about some really big important things (and all sorts of other-sized things in between); this was a reminder to keep myself open because by blindly grabbing onto my preconceived notions [such as of smoothies] to pretentiously dismiss anything new to me, I think I’m the only the person that loses. Preheat the oven to 250F. Line a tray with parchment paper. Whisk together the oil, honey and salt. In a separate bowl, mix together the remaining ingredients. Pour the honey/oil mixture overtop and mix until combined. Spread in a thin layer on the pan and bake until golden (don’t mix), around 45 minutes. Let cool. So, it is true that the four year mark for tentimestea passed back in July. 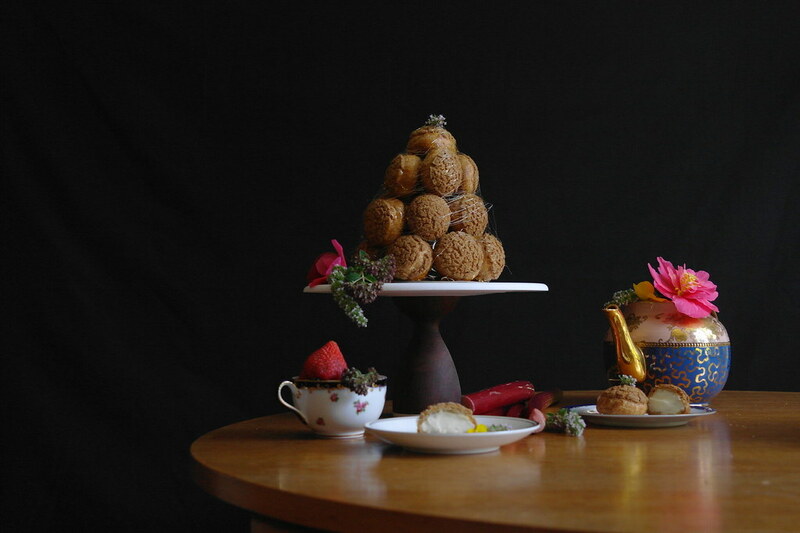 And it is also the case that I made this croquembouche back in July as well. 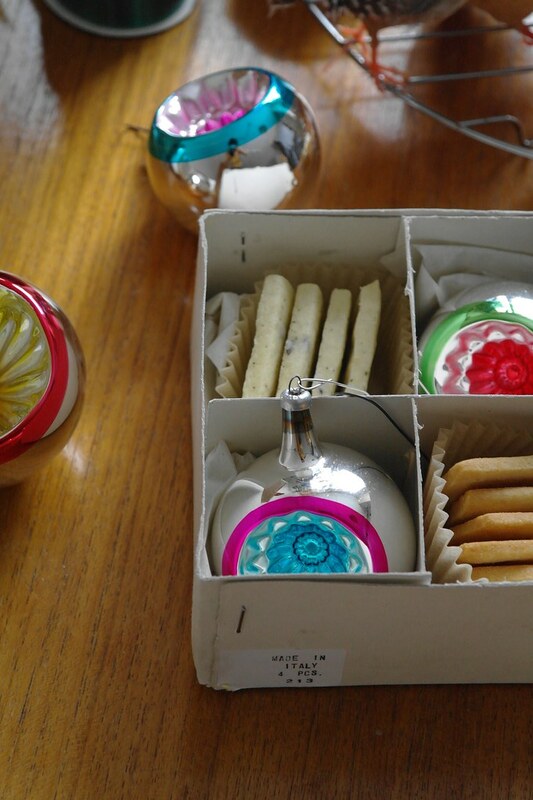 So we’re running a bit late for a blogiversary post, and to be fair it would seem a bit more appropriate to have holiday-themed posts around this time, but this is all part of my new plan. I think. Recently an advisor, whom, after making my acquaintance 3 minutes prior, described me as being rather reticent [in the context of poking people in the arm, of all things]. I was initially a bit confused and reticent to accept said description, but upon further reflection, figured that came with connotations of cautious, and probably a bit fearful. Fair enough, advisor, fair enough. I think that sort of reticence happened here in the blog as well. I don’t need to fully recap all the anxieties around posting (see the last post for difficulties on thinking about something to write about). But I would say that maybe I’ve gotten a bit too worried about quality and about timeline suitability. I’ve found myself in a sort of paralysis–not wanting to post new drafts because there are still old ones or now the ingredients are out of season, but not wanting to post old drafts because now I think they’re sort of awful. Anyways, now I think I sort of just want to relax and embody the logo of–annoyingly enough–a certain popular shoe/athletic wear brand. Put up an okay recipe, or even a disaster with plenty of exposition, maybe a bit of a story, at least one decent picture, as well as a mildly coherent preamble. 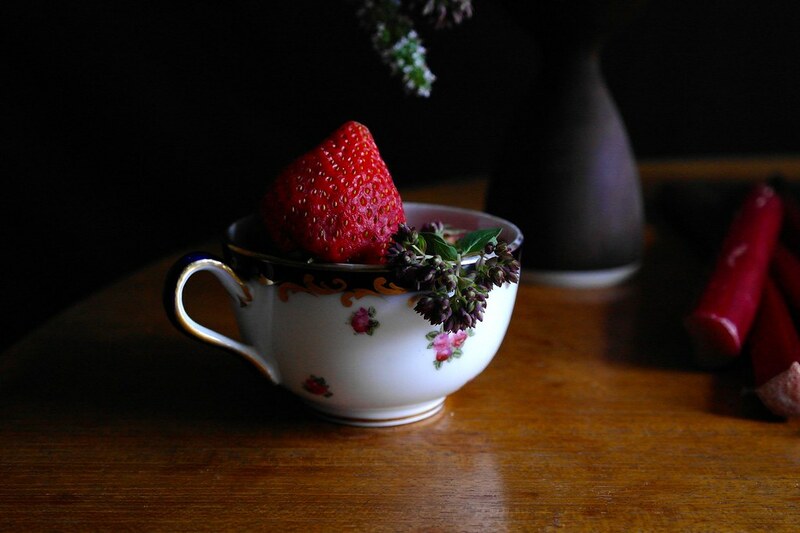 Hence, finally putting up the 4th blog birthday post half a year later without worrying that strawberries and rhubarb are out of season and that the timing really makes no sense at all. Now the structure of this blog post is very quickly going to resemble the structure of my thoughts around blogging–which is to say like two very different parallel blog posts shoved together into one. Because, at the same time, recently I’ve been finding myself with new demands on my time and while it’s true that one can make time for many things, it’s also true that some things can be rather consuming and one can end up, if not time-lacking, at least fatigued, which can preclude those many things from happening. It has sort of gotten to the point where I don’t really have a sense of how this blog fits into my life anymore or if it really should at all. When I write those sort of things, it feels a bit like one of those breakup talks where you’re musing about the topic even though it is more saddening than relieving and you just hope that actually deep down things are okay enough and then one of you will get all straightforwards and real and maybe even say something that makes both of you feel better. But, tragically, sometimes all the beautiful hopes are entirely one-sided on your behalf. Holding this sort of metaphorical conversation with a blog is generally a recipe for a tragedy as blogs don’t really say all that much. But I suppose the key is that I don’t really need to come up with an answer or declare a solid ultimatum. Not right now and not exactly ever (though to be honest, Flikr is really pushing me to do that – topic for another time). 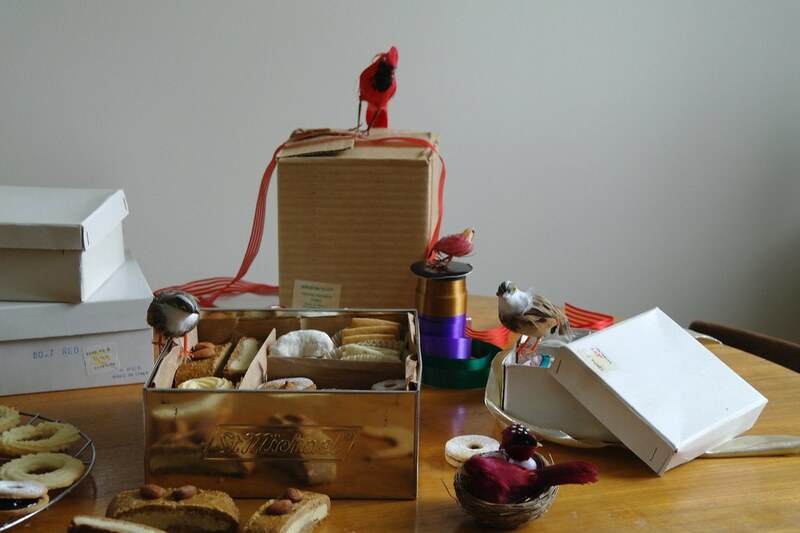 As much as I may neglect blogging, I find something mildly comforting in making things. Entirely insignificant things, but there’s still a sense of ownership and of working towards something. When I was younger it was stories, followed by brief periods of poetry, attempts at graphic novels and watercolours. At some point, baking also took hold and it remained something untouched by obligation and responsibility and assessment going on elsewhere in my life. Publicizing it in a blog started to change things as I became more particular, but generally any judgement that came my way has been excessively kind, encouraging and supportive. 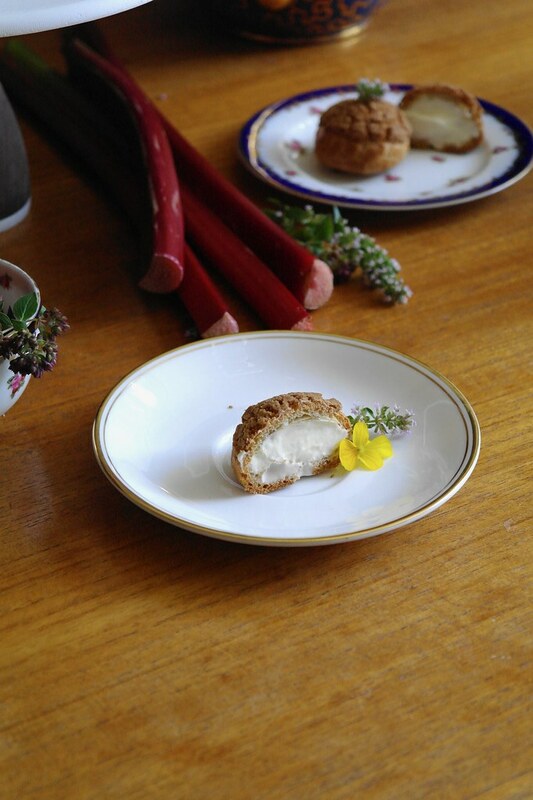 Continuing in the theme of previous blog birthday posts, this is also a strawberry rhubarb-themed cake of choux pastry filled with cardamom pastry cream a bit of strawberry rhubarb curd. 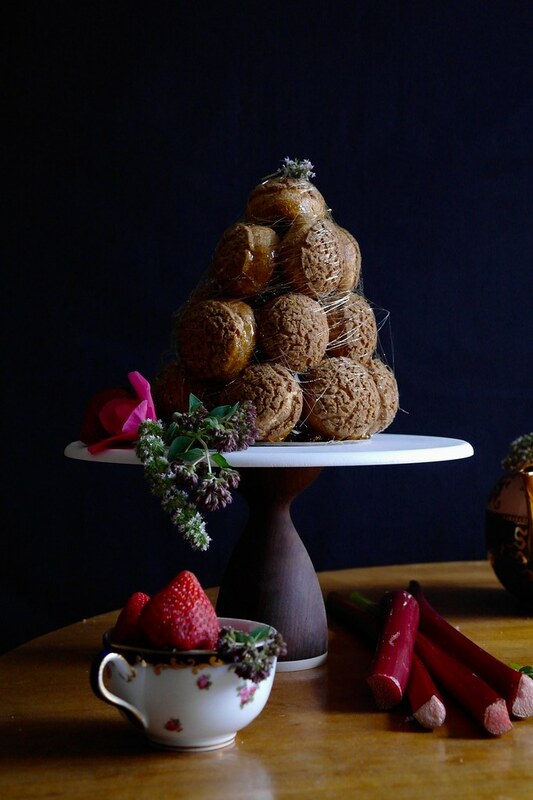 Contrary to my expectations, the croquembouche came together fairly smoothly. I kept it small and while it did end up very, very lopsided, the overall construction was completed with only minimally burnt fingertips. 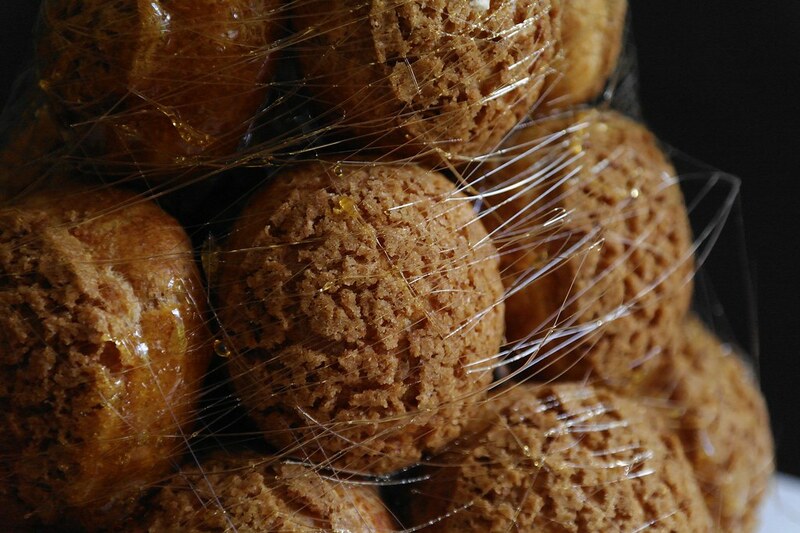 Not that this alone particularly makes it worth the extra work, but the caramel strands draping each choux (and, less poetically, the wads that crystallize each puff into place adjacent to the others) are quite tasty. 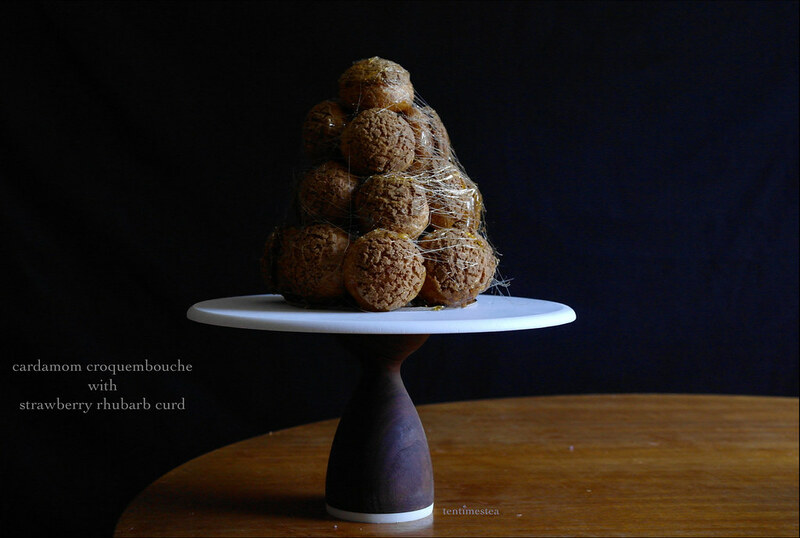 It is probably best to put together the croquembouche not too long before intended consumption as I found that the fine strands of caramel just dissolved away after a night in the fridge. Finally, a note on the florals: budding sage and petunias. I was particularly surprised by the petunias – it turns out they are edible (maybe I was vaguely dissuaded from that possibility given the slightly gaudy hue we chose). The petals are big, crisp, tart, and sort of juicy actually. And they grow pretty well on shady balconies. 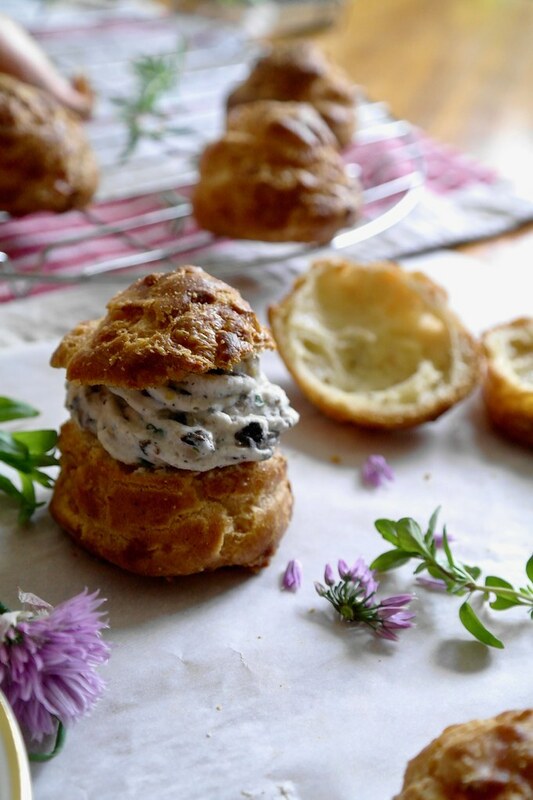 Adapted from the cream puff cookie topping from Bouchon Bakery by Thomas Keller and Sebastien Rouxel. Mix all ingredients together until it forms a cohesive dough. Cut a piece of parchment paper to fit a quarter sheet pan, place the dough on top, and cover with a second sheet of parchment. 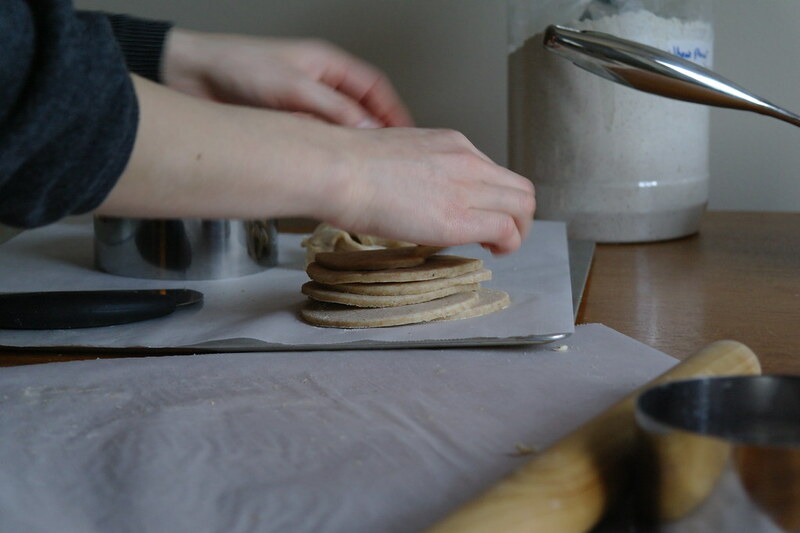 Roll out very thinly until the dough roughly fills the parchment paper in some sort of oval-type shape (around 1/16″). Slide onto the pan and then freeze until firm. Cut out rounds around 3-cm in diameter (a bit smaller than the choux mounds). Adapted from Alain Ducasse via Food and Wine. 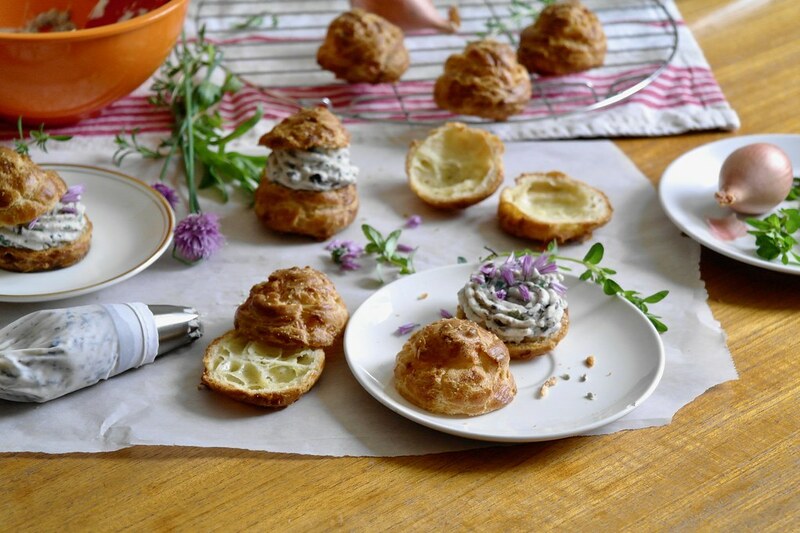 Makes around 24 medium-sized puffs. In a saucepan, brown the butter. Let cool a bit before adding the water, milk and salt, then bring to a boil, add the flour and quickly mix in with a wooden spoon. Lower the heat and continue to cook the mixture until it forms a ball. 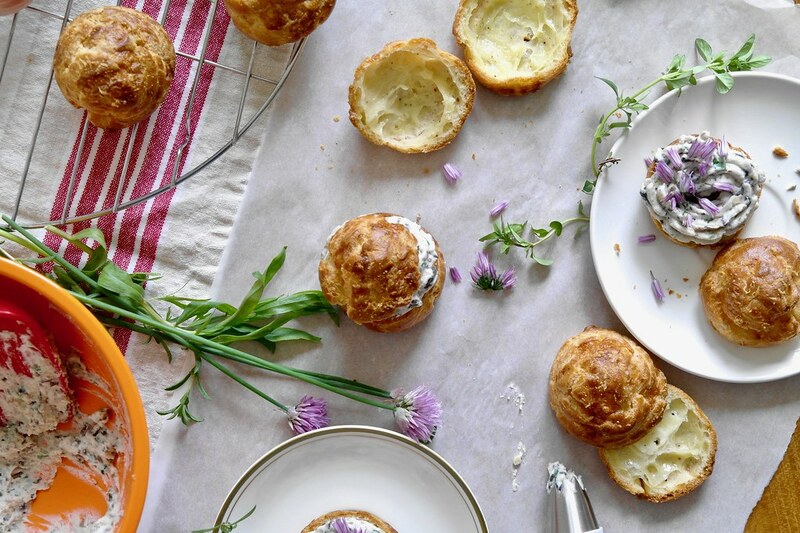 Remove the pastry from the heat and let cool slightly before adding the eggs one at a time, beaten into the pastry most easily with the aid of a wire whisk. The dough should now be shiny, but not fluid. Transfer the pastry to a piping bag fitted with a large round tip. Pipe mounds of pastry, around 1 tbsp in size evenly spaced on a sheet pan lined with parchment paper. Top with a round of the craquelin. Bake for 15 minutes at 400F, then decrease temperature to 375F and bake 15 minutes or until puffed and well browned. 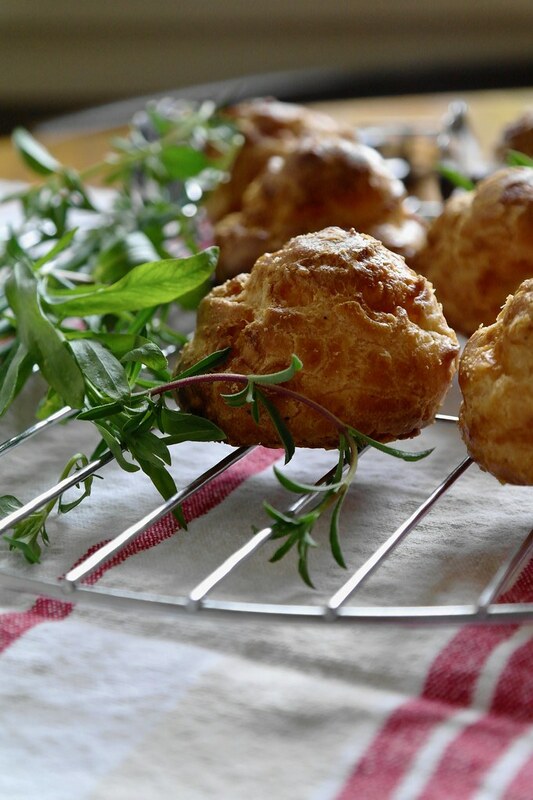 Poke a hole in the bottom of each puff to let the steam release and let cool on on a wire rack. Combine the rhubarb and strawberries in a saucepan with 1 tbsp sugar. Gently warm and cook until fruit is softened and juices are released. Transfer to a jelly bag set in a strainer and let juices drain for around an hour. Squeeze to extract any remaining juices. As I cooked down my fruit a bit, I ended up with a fairly concentrated 70mL–if the juice seems dilute, it can be simmered down. Combine the 70mL juices with 1 tbsp of sugar and the eggs in a small saucepan. Heat gently to warm, add the butter in small pieces and whisk to melt in. If you’re concerned about the colour, you can also add a few hibiscus petals now to intensify the pink–and the taste is quite nice as well! Continue cooking until the mixture begins to steam, being sure to whisk constantly. Cook until thickened, not letting the mixture boil (if you’re a temperature sort of person, it should be at least 155F). Pass through a fine sieve, cover and chill. Adapted from Alice Medrich via Food52. For the pastry cream, warm the milk until scalded. Add the cardamom and vanilla and let infuse around 10 minutes. Meanwhile, whisk the sugar and rice flour in a small saucepan. Whisk in a bit of the milk, a couple tablespoons, until smooth, then whisk in the egg yolks and the remaining milk. Over medium heat, warm the mixture until it just begins to bubble. Continue cooking, whisking constantly, for 5 minutes or until nicely thickened. Pass through a fine sieve into a bowl, cover with plastic wrap pressed against the surface, and chill. 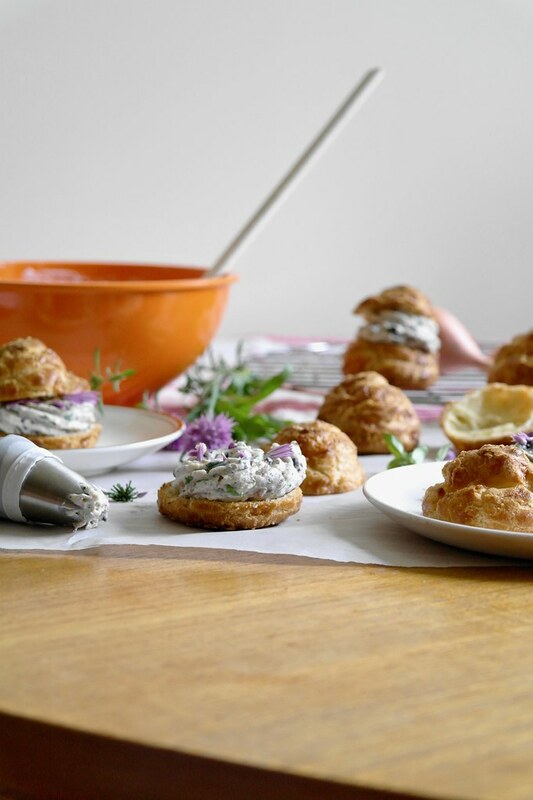 Fill the choux: Transfer the curd to a piping bag fit with a small metal tip. Transfer the pastry cream to another piping bag. First pipe in a bit of the curd into each puff, then finish filling with the pastry cream. Chill. 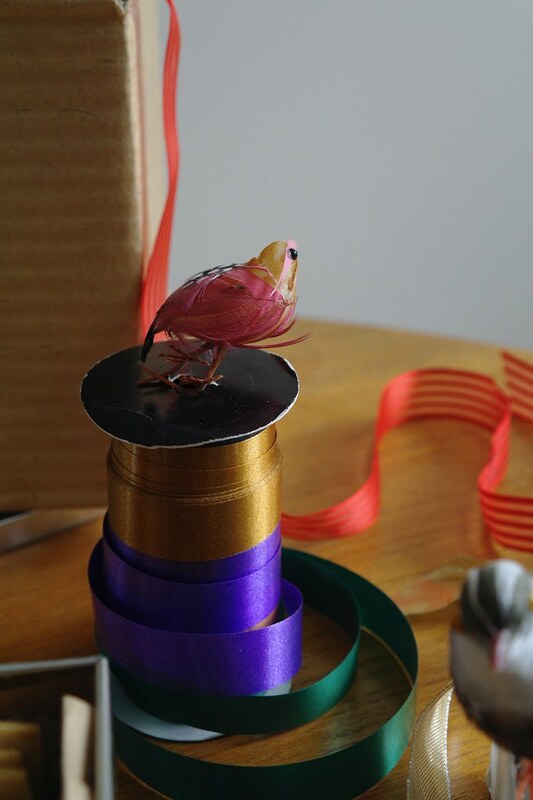 For the croquembouche base, I used a piece of metallic cardboard salvaged from some pastries bought from the bakery. I also made an aluminum foil cone for support–but despite the leaning tower look, the tower was quite steady so I don’t think this is necessary. When you’re ready to assemble, place the sugar with a bit of water in a saucepan and bring to a boil. Let cook, swirling occasionally, until the sugar caramelizes. 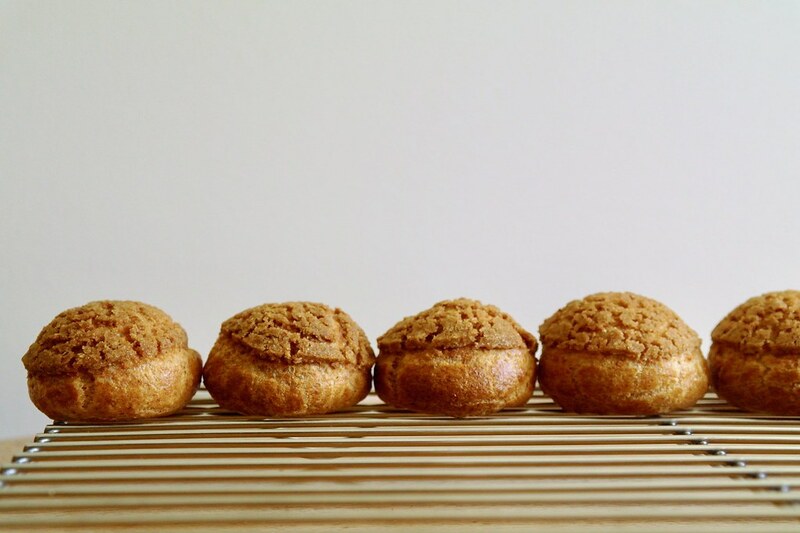 While the sugar caramelizes, arrange the puffs from largest to smallest (for once it’s good to be a bit inconsistent when piping the choux pastry!). Remove the caramel from the heat. 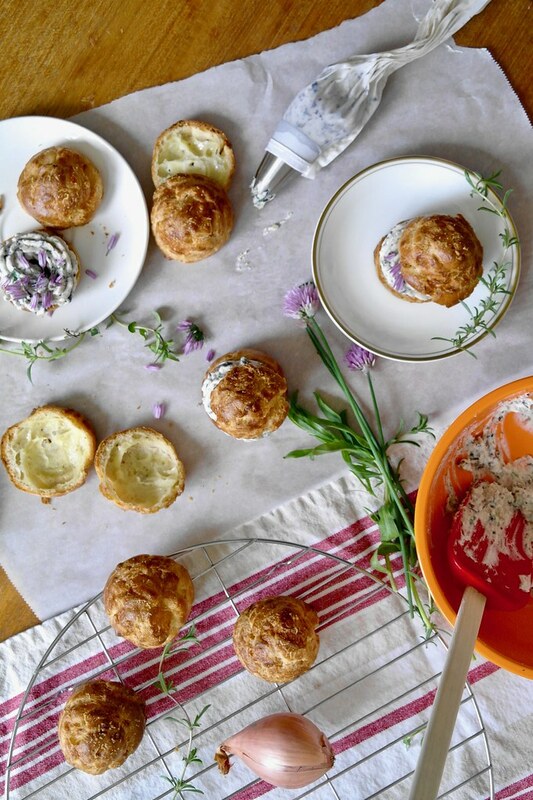 Begin with the largest choux puffs. Dip the side of the first in caramel and place on the base. Dip the next on two sides at 90 degree angles to each other so you can glue this puff on the base and to the puff next to it. Continue to repeat until you’ve built a circular base–I used 7 puffs. For the next circle, I used 6, then I used 4 and finally put one puff on the very top. If the caramel starts firming up, place it back on the heat to warm it up again. Finally, at the end, dip a fork into the caramel and drizzle threads of sugar around the tower–the caramel will need to be a bit cooler for the threads to form. Today, instead of writing a blog post, I bring you an excerpt from the world-renowned and very insightful website, Blog Tropes. Is this the equivalency of submitting a Wikipedia page for an assignment? Well yes, you can certainly see the state of inspiration that I am in. A staple in the blog post topic repertoire, Writing about How Hard It Is to Think of Something to Write About, uses the body of the blog post, ideally reserved for witty anecdotes or authoritative and relevant tips and advice, to describe how the author is struggling to write said blog post. When phrased that way, Writing about How Hard It Is to Think of Something to Write About sounds almost clever and meta, but this lowbrow technique may be employed as a desperate method of getting out of needing to think of something actually engaging, original, or interesting. Often used in conjunction with Lamenting the Sheer Quantity of Drafts and citing Lack of Blogging Inspiration as though an existential crisis of the most significant variety. Curiously, lamenting the number of drafts only seems to precipitate the accumulation of more and more drafts (see Vicious Circle Theory or how in this post from a couple of years prior, a naive blogger complained about having 27 drafts, then 40 drafts, when now they have over 70). This topic may be brought into use when the stores of Throwback to Childhood Memory of Physical Education have been exhausted or become rather repetitive. Not just mandatory gym class, any childhood memory is apt to being overused–while spaced out over a few years, the same glorious yet essentially cliche lemon cake becomes a bit dull when it is so lovingly described for the second third time. sufficiently anonymous (see Not Revealing Too Much Information on the Internet). However, it falls prey to a number of pitfalls, namely Lack of Novelty and Substance. Indeed, superfluous adjectives and excessive comments in brackets (for example, a comment such as this one) are able to expand a few sentences into a brief, yet lofty blog post. However, with no input of new ideas and material, writers may fall back onto the same combination of words which take on a stale and repetitive taste, for both readers and the writer themself. A blogger in trouble can be identified when they have used this very topic for s–e–v–e–r–a–l–l[sic] blog posts, transforming their blog into an endless Echo Chamber. While it is true that in certain cases, originality in the mode of delivery can the message “I am simply having such a dreadfully difficult time thinking of something to write about” a bit less dull, Gawkish Attempts at Poetry are always a flop and are strongly cautioned against. Fortunately, for the beleaguered blogger there are some alternatives to the prosaic and hackneyed Writing About How Hard It Is to Think of Something to Write About: Recipe Amalgamate (which appears long, not due to a deeply though blog post, but due to so many recipes), pseudo-profound Photo-centric Posts, Trick Your Little Cousin into Writing Posts for You, and the most reliable, Copy and Paste Entries from Blog Tropes (with the valiant intent of better informing the general public). Subtrope of Blog Fatigue and Blog Block. 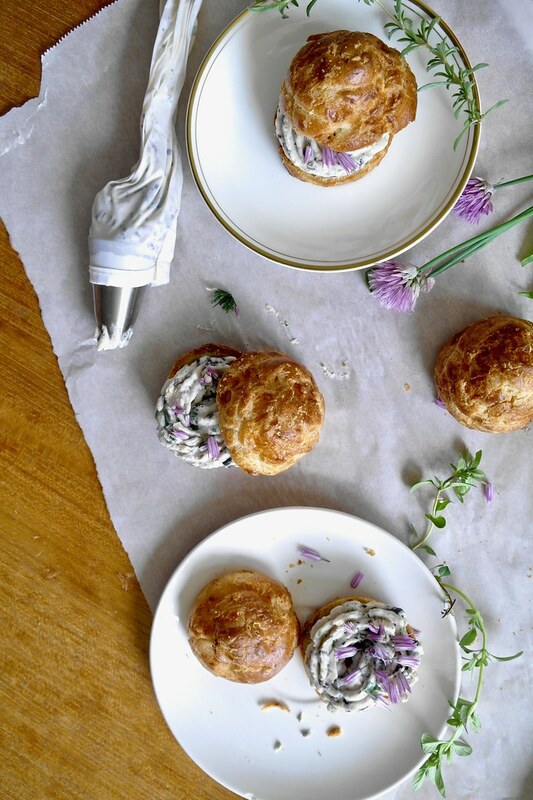 There are other choux pastry recipes on the blog, but ah I quite like this one! The proportions are easy to remember, and instead of relying on my faulty instinct as to how much egg I should add, I followed the recipe. Which I do not always recommend because most people have much more reasonable and helpful instincts than me. 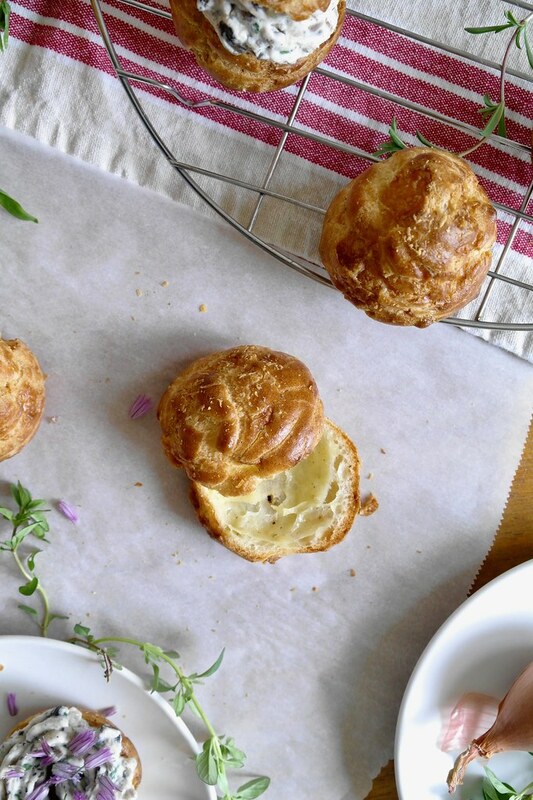 But I think was a useful exercise in helping me recalibrate my choux-pastry-consistency-instincts a bit. I found the choux pastry consistency was thicker than I usually make it, and it puffed so nicely! 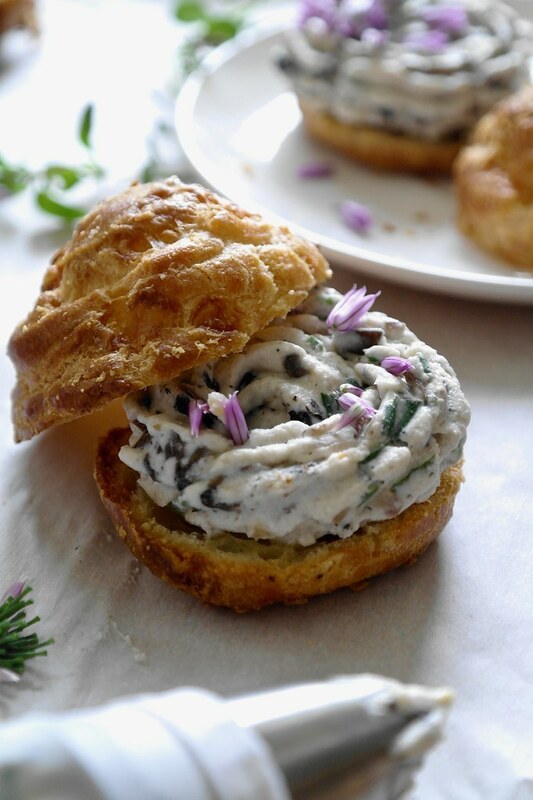 The filling is quite fun–a chance to use all sorts of yummy-sounding things like chestnuts and mushrooms and ricotta, and use them together! It turned out really nicely actually, though it took some tinkering. The filling began as far too rich–after all, strained whole milk ricotta and heavy cream? Followed with butter-cooked mushrooms? Then the shallots added a bit of sweetness that pulled some dessert-y notes out of the ricotta. I added enough lemon juice to bring the filling from cloying to, no, not a staple of the balanced diet, but to a balanced taste. Plenty of finely chopped chives and herbs also helped to brighten the filling. I think the key is to keep tasting as you make it to make sure it tastes right. Which is not something I get to say too often when it comes to baking. 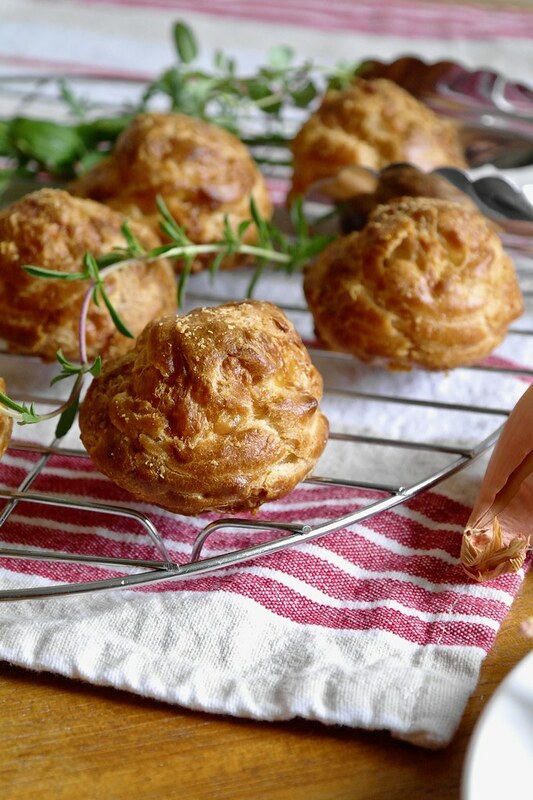 Each gougère is quite rich–as far as serving size goes, I recommend cutting them into pieces. 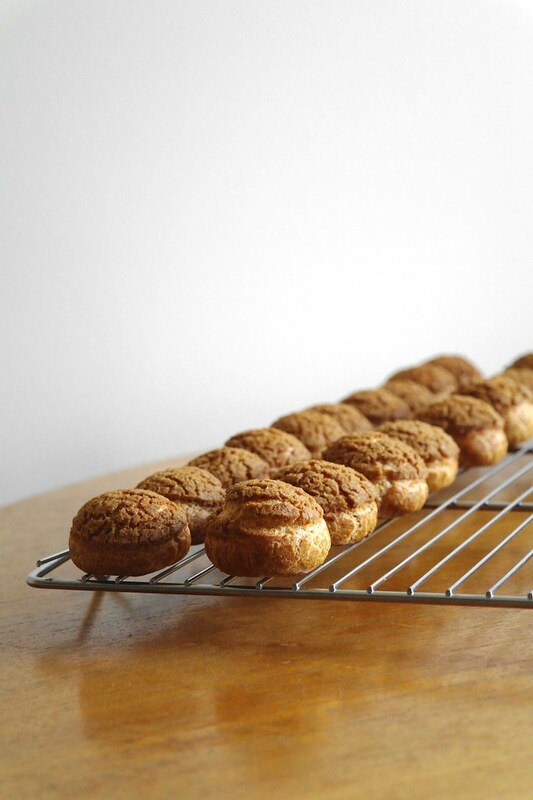 The choux pastry makes 12 puffs, but the filling is sufficient for around 8 (filled quite generously!). 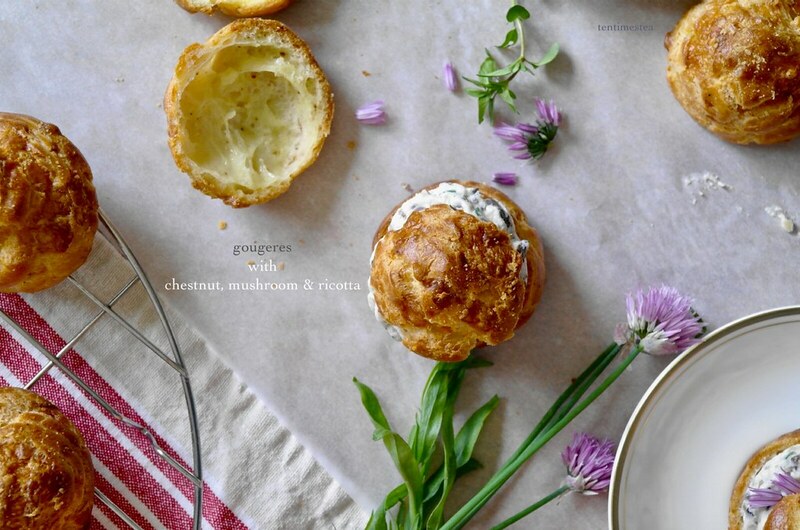 The gougères are very pleasant eaten on their own as well–they’re light, crisp, and savoury. If the plan is to eat them without filling, even consider sprinkling them with some very flaky salt before baking (or more cheese). I think these would be lovely augmented with some cooked vegetables or greens, layered above or below the filling as well for something more substantial and less solid cheese. Borrowed, in their near entirety, from Alain Ducasse via Food and Wine. Makes 12 big puffs. In a saucepan, warm the water, milk, salt and butter until the butter is fully melted. Bring to a boil, add the flour and quickly mix in with a wooden spoon. Lower the heat and continue to cook the mixture until it forms a ball. Remove the pastry from the heat and let cool slightly before adding the eggs one at a time, beaten into the pastry most easily with the aid of a wire whisk. The dough should now be shiny, but not fluid. Mix in some ground black pepper and nutmeg, followed by the grated cheese. 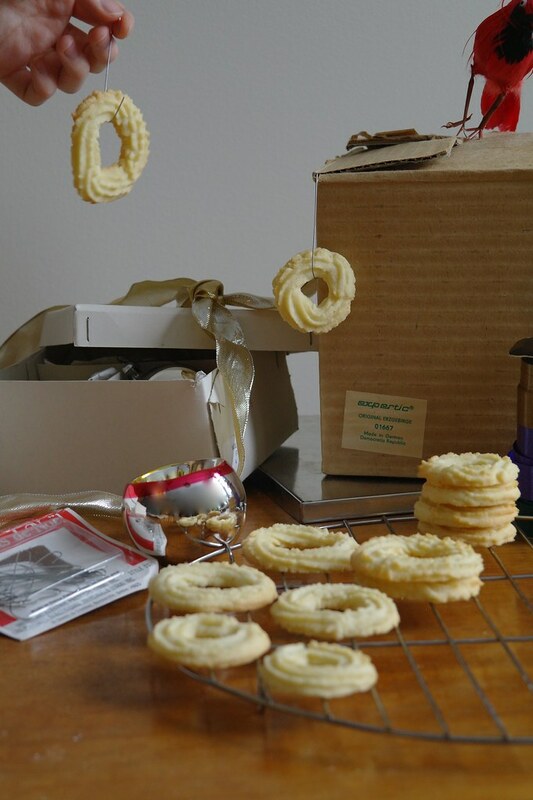 Transfer the pastry to a piping bag fitted with a large round tip. Pipe mounds of pastry, around 1 1/2 tbsp to 2 tbsp in size evenly spaced on a sheet pan lined with parchment paper. Lightly wet a finger and smooth the top of the piped choux pastry. Finely grate a bit of pecorino romano (as I had, shortsightedly, used up all the gruyère I had in the choux pastry) or more gruyère over top of the puffs. Bake for around 25-30 minutes or until puffed and well browned. 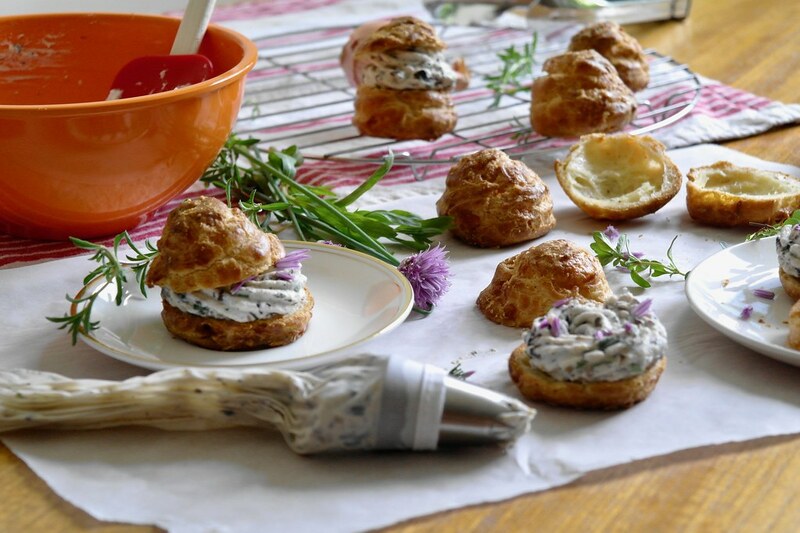 Poke a hole in the bottom of each puff to let the steam release and let cool on their sides or on a wire rack. Makes enough filling to fill around 8 gougères. Cut the mushrooms into small pieces; heat some butter in a skillet over medium-high heat and cook the mushrooms with a bit of salt and pepper until browned. Mince the shallot and cook with butter until translucent and browned as well. Let the mushrooms and shallots cool. 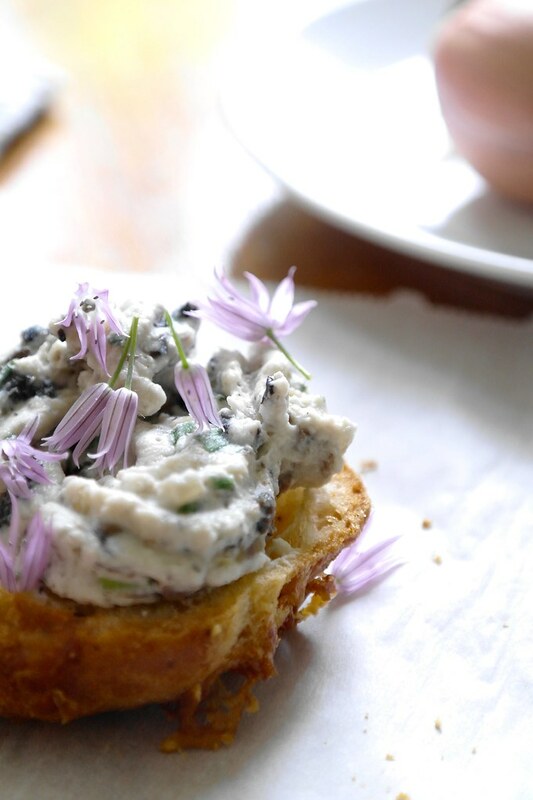 Combine the ricotta with the mushrooms, shallots, chestnuts and herbs. Season to taste with salt and pepper and the lemon juice. 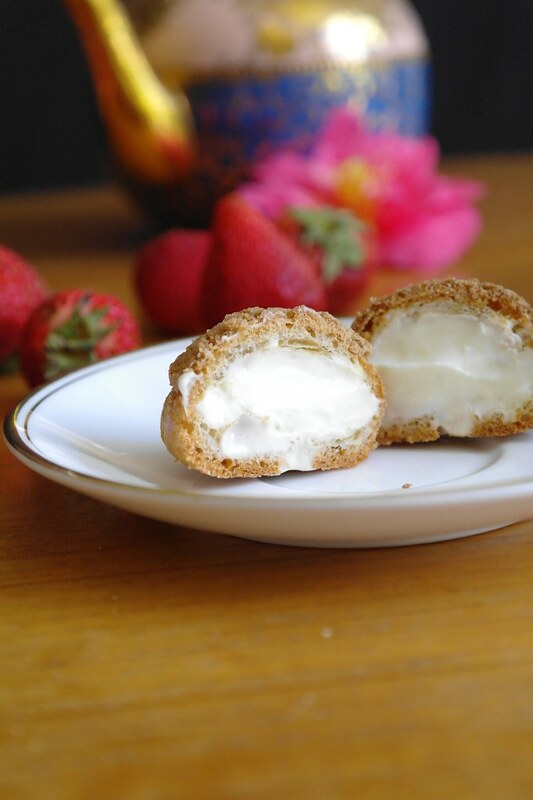 Whip the cream until stiff, then fold into the ricotta to lighten. Slice the gougères leaving a thin base and a tall domed top. Transfer the filling to a piping bag fitted with a large star tip and pipe a ring of filling over the base of the gougères. 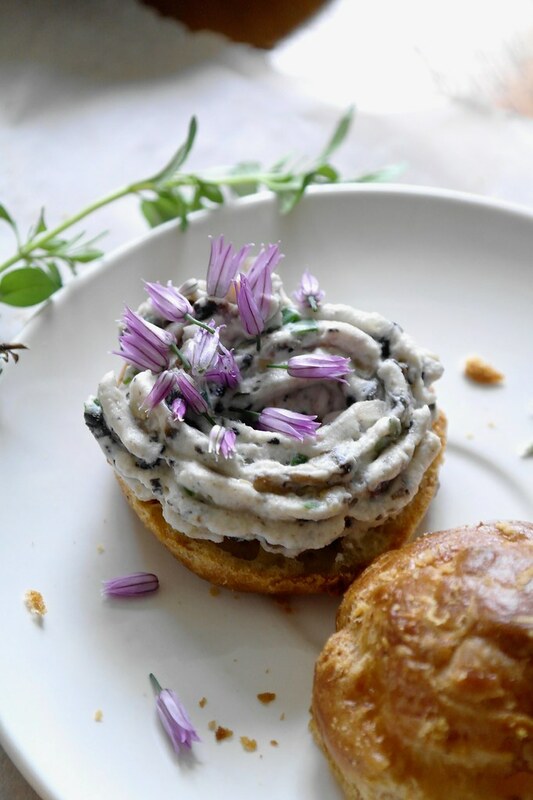 Sprinkle with chive flowers and place the top of the gougère on top. 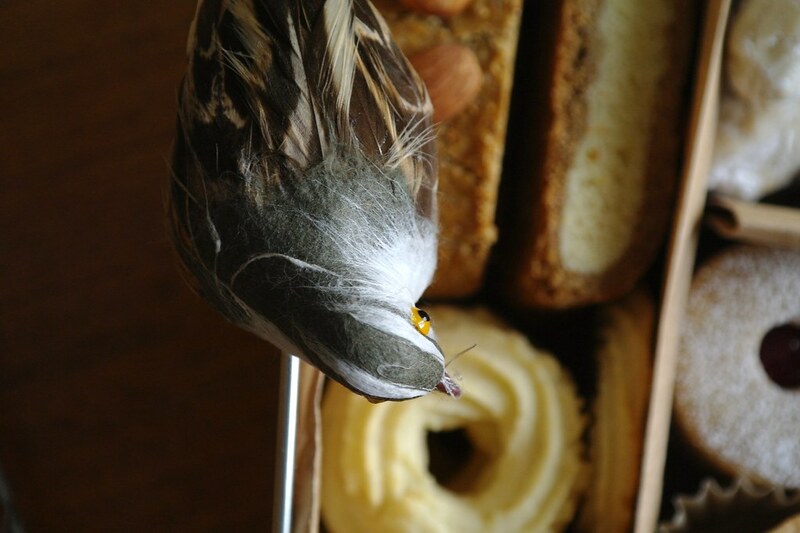 When I was younger, we would purchase this lemon loaf cake from Première Moisson in Montreal. I thought it was so special and regal, packed in a stiff transparent plastic box on a gold piece of cardboard. And packed was key: the cake barely fit in the box, and each time you slide it out, the top of the cake streaked the plastic with glaze. Those 1800 cubic centimetres contained satisfaction for days. The cake had two presentations — first it would be the crisp morning coating of a crackly sugar glaze, and later, after a day or so, the glaze would be softened and the crown of each slice would be moist and saturated with lemon and sugary glaze. I’ve been trying to make a lemon cake that lived up to my excessively detailed and visceral memories for a long time. That goal had vaguely concluded with the previous lemon loaf cake–I wasn’t fully satisfied, but I had brought that cake recipe as far as I could. I was fairly certain that was to be that and any advances in lemon cake-making remained dormant until the last time my grandparents were in Montreal. They brought back a shrink wrapped loaf cake, and while it wasn’t glazed, this cake, labelled as “week-end citron”, had the tender and fine crumb that I remembered. But best of all, the name was also familiar: the “week-end cake” recipe from Dorie Greenspan’s Baking Chez Moi from which I had previously adapted this chestnut and prune version. 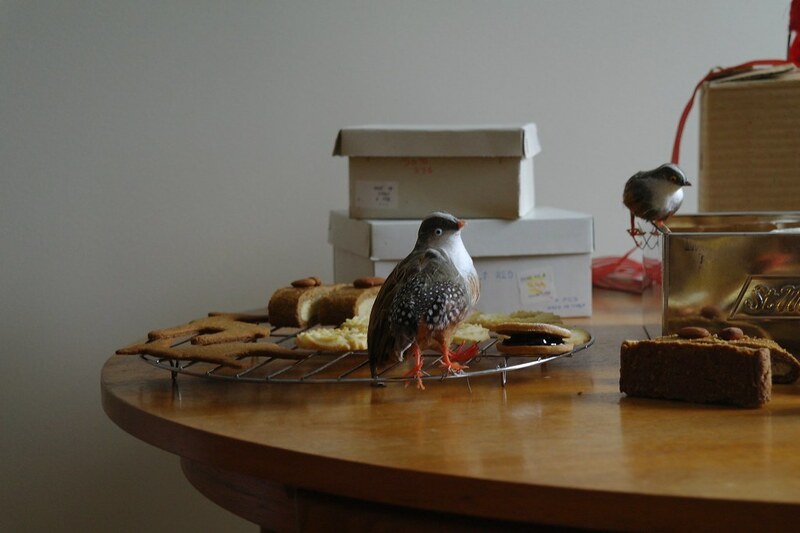 In fact, the crumb and richness was quite similar to the cake I had made. A look at the ingredients also seemed to confirm that this rather odd-sounding “week-end cake” (“odd” from my very limited Canadian anglophone perspective) was actually a thing (duly noted)–the cake from Première Moisson also contained heavy cream and rum. I set about making a lemon adaptation of the weekend cake, taking some of the core principles that guided my previous favourite lemon cake. Based on Smitten Kitchen’s lemon cake, we use two glazes: some lemon juice squeezed over just out of the oven followed by a set sugary glaze once the cake is cool. But let’s take some measures to control the sweetness–just using straight lemon juice for the first soaking and cutting sugar from the cake. This is key so we can completely coat the whole cake (and I mean every spot of the top and sides) in a doughnut-like thin sugary crust without it being overwhelming (no thick drizzle please!). In the previous rendition, cuts to the sugar budget compromised texture and led to a bit of an anemic crust. This cake cooks long enough in the oven to end up with a golden brown crust, and has a rather lovely texture that is less dependent on proper butter-sugar aeration. This cake is like I remember in the important ways. The crumb is finer and denser, and straightforwardly rich and each slice is solid, not crumbly. The deeply browned crust peeking out from below an icing sugar glaze and the profile when you cut a slice from the middle–of a tall, proud craggy crest of lemon yellow cake–is just what I remember. This cake is also not like I remember; in fact, I think it’s a wee bit better in some of the even more important ways such as being very, very lemony. I’ve been very clear with the fact that this blog is not quite a refined and reliable source of recipes. Rather, it’s far better characterized as a mismatched aggregate of ideas and inspiration and disasters, but mostly passably edible things that require some further work that I often lack the time and patience to really undertake. But oh ho ho. This recipe? Well. I’ve made this cake upwards of seven times now (it is a good one to bring to the lab). And each time it has been actually rather excellent. Of course, all the credit goes towards the reliable base cake recipe from Dorie Greenspan, because in fact, this cake is far easier and reliable than the previous one. With melted butter, there’s no need for softening nor emergency measures when your perfect room-temperature butter gets wrecked by those dastardly fridge-temperature eggs. Nor do you need to actually put in the work of creaming butter (which I know really really does pay off, yet I am never able to convince myself of that in the moment). Now this earlier lemon cake still has plenty of merit, just of a different sort. When your butter and eggs are at the right temperature and properly creamed, the crumb is softer, lighter and fluffier. It’s not worse at all (and probably better to some), it’s just that this cake is the one that I’ve been looking for all this time. Well. I’ll try not to overstate and exaggerate too much. It’s a very, very small thing, but it’s still a really lovely cake. Adapted from Dorie Greenspan’s brown butter and vanilla weekend cake in Baking Chez Moi. Preheat the oven to 350F. Line a loaf pan with a parchment paper sling and butter the exposed sides of the pan. In another bowl, rub the lemon zest into the sugar until very aromatic. Add the eggs and whisk thoroughly to combine, then whisk in the vanilla extract, rum and finally the heavy cream. Mix in the flour mixture with a spatula, and finally add the butter in 2-3 additions, folding in the butter completely each time. Scrape the batter, which is beautifully ribbony, into the prepared pan. Bake for 45-55 minutes or until an inserted skewer is removed clean. Remove from the oven, prick lightly all over with a wooden skewer, and drizzle overtop juice of half a lemon. Let cool around 10-15 minutes before removing from the pan and placing on a wire rack to cool completely. 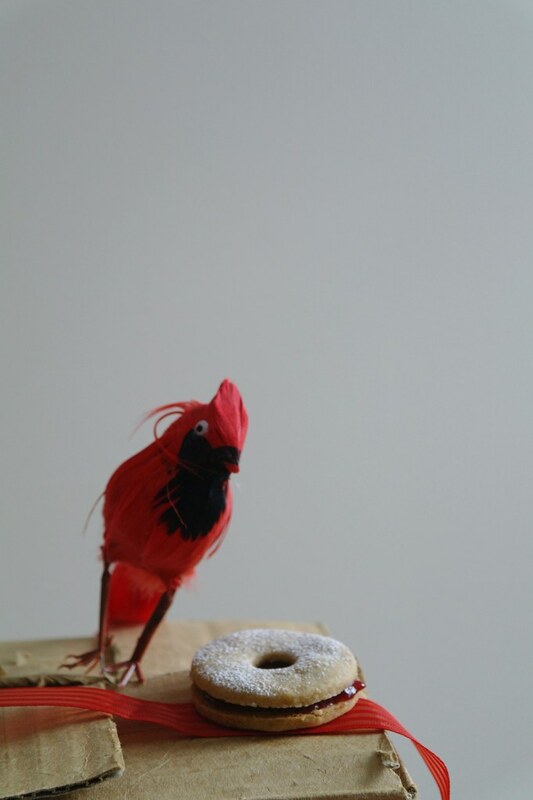 For the second glaze, I recommend doing this the day you’re planning to serve the cake. Usually I bake the cake the night before, and then finish glazing next morning so it is freshly set before bringing it as a gift/to the workplace. For the sugar glaze, whisk together the icing sugar with enough lemon juice (usually a bit less than half a lemon) to make a glaze that is thin and drizzly (it will appear nearly translucent), but will still set. Place the cooled cake on a wire rack over a pan. Pour the glaze over the cake, using a large offset spatula to spread the glaze evenly over the sides of the cake until it is completely coated. But they rise perfectly, they’re quicker to make, and they don’t get dry. 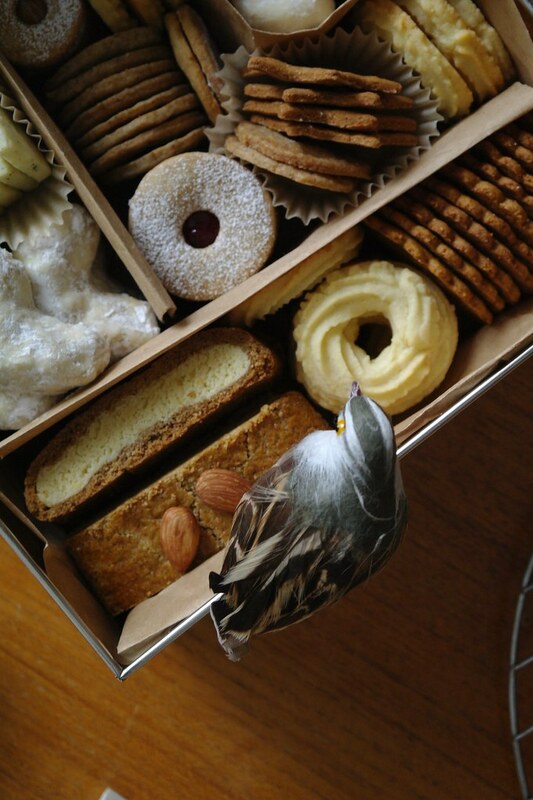 Unlike my experience with madeleines. 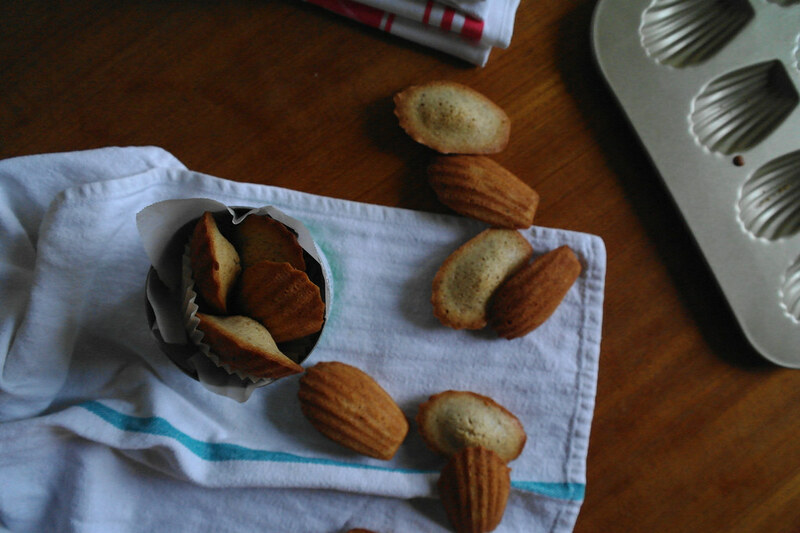 A day later, as soon as the madeleines have had some time to cool off…they become dry! Or I might just be over baking them? The top crust is caramelized, crisp and candy-like, while the inside retains a tender, moist and buttery crumb. 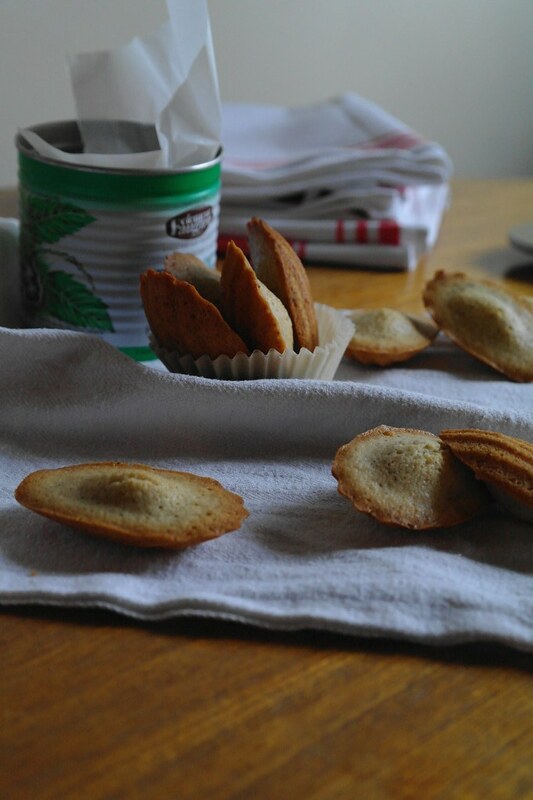 So they’re not madeleines…but they’re very delicious and very cute. 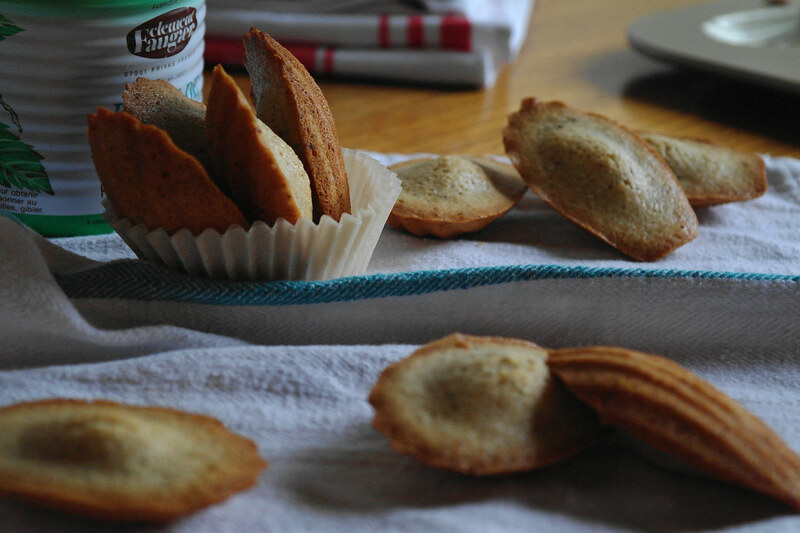 Recipe adapted from Bouchon Bakery’s financiers. 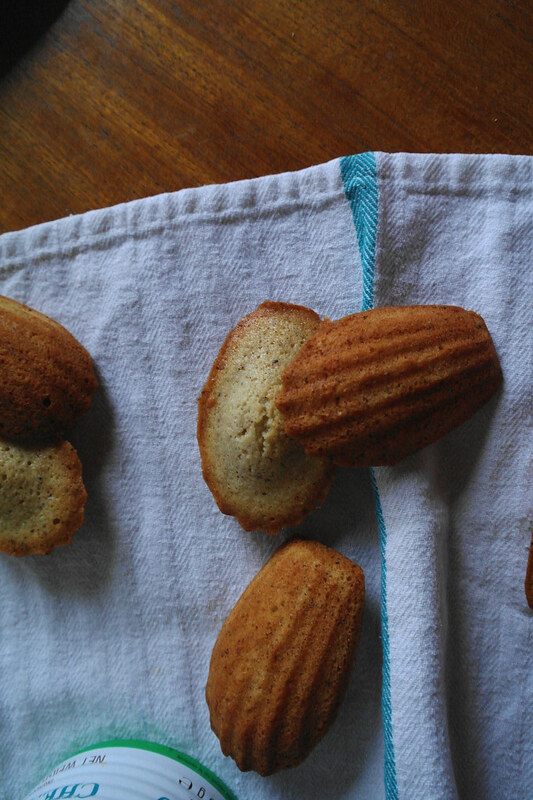 Not madeleines. The amaranth flour doesn’t even deserve a mention–it was just something I acquired recently and I decided to throw some in. I really don’t know what I’m looking for though when it comes to amaranth…I’ll have to try a cake or shortbread with more amaranth to see what it’s like. Butter a madeleine pan with 16 madeleine wells and chill to make the butter firm and the pan cold. Brown the butter and set aside. Whisk together all the remaining ingredients except for the egg whites. 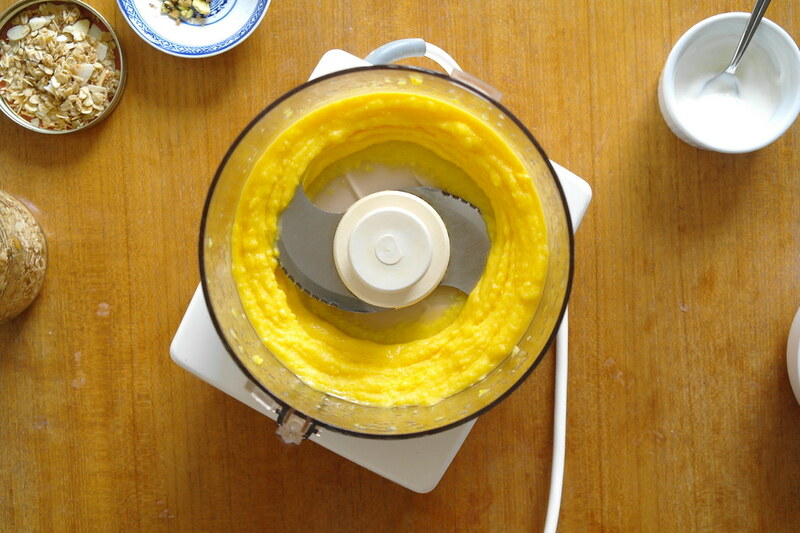 Make a well in the dry ingredients and gradually whisk in the egg whites, beating until smooth. Whisk in the very warm browned butter in two additions. 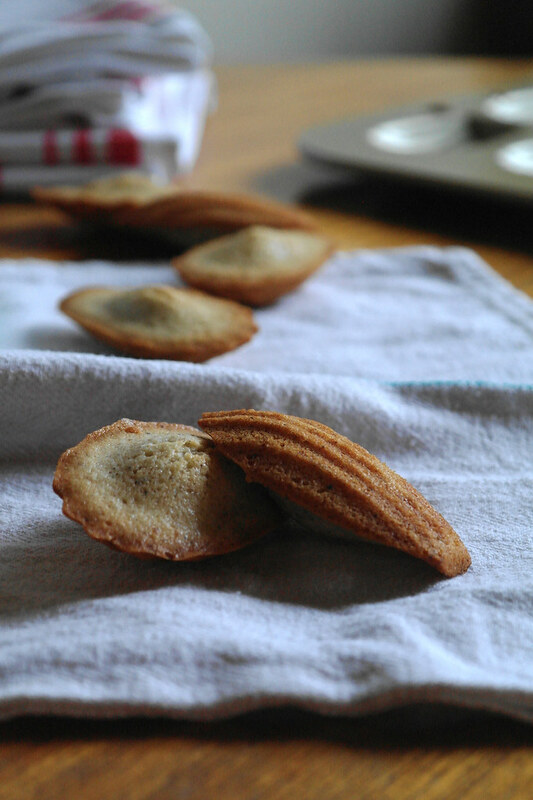 Place one spoonful of batter in each madeleine mould. Pop in the oven, turning the temperature down to 350F. Bake 10-15 minutes or until well lightly browned on the top edges and firmed on top. 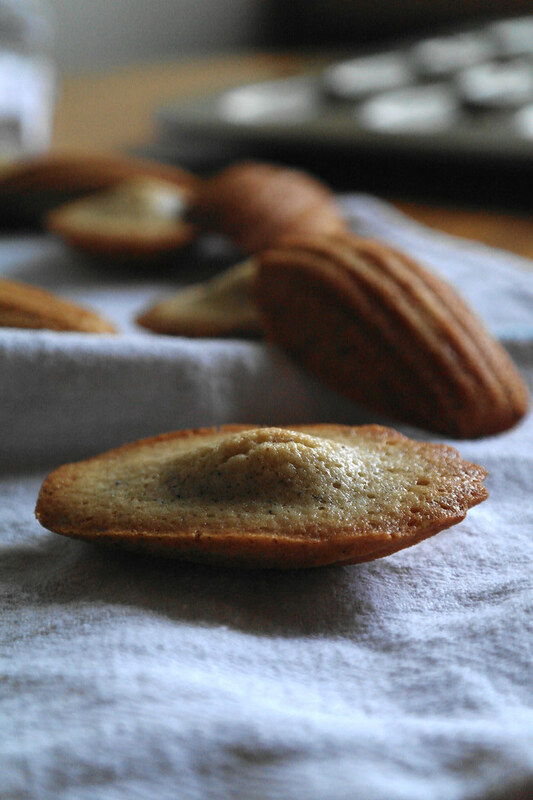 As soon as you can manage, carefully transfer the not-really-madeleines from the pan onto a wire rack, setting them shell-patterned-side down. Leave out the cardamom. Reduce the ground almonds to 35g. Brown 44g butter, and whisk together with 42g pistachio butter until smooth. Fold this mixture into the batter at the end. Today The Cousin returns and thankfully also writes a blog post for me. Greetings readers of tentimestea’s blog! I am The Cousin, a.k.a The Writographer, and I am back to help out my cousin with her blog while visiting for the holidays. 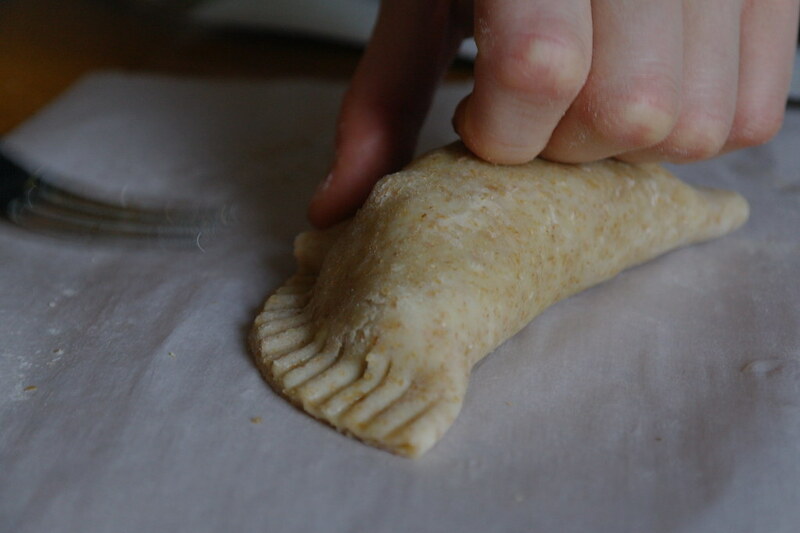 Today, the two of us are making apple turnovers, however instead of the traditional triangular shaped turnovers, I have managed to convince my cousin to let us shape them as dumplings (this is the first time I have successfully changed my cousin’s mind when it comes to baking). 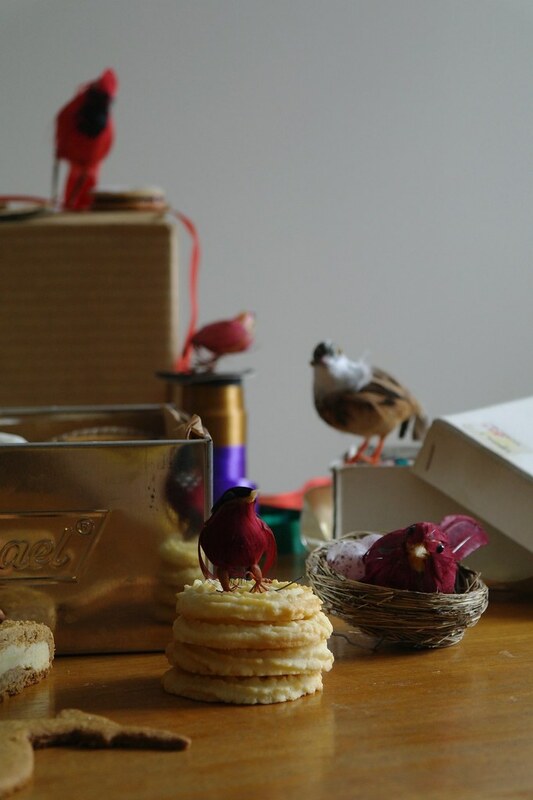 The last time I wrote a post for this wonderful blog, I had decided to write a play-by-play of what went down in the kitchen during our baking session. However, for this post we had a lengthy discussion and it was decided that I should not do another commentary of the baking session. Although, all I will say about the baking session is that lighting was not on our side. We spent much time playing with the aperture, shutter speed and white balance. 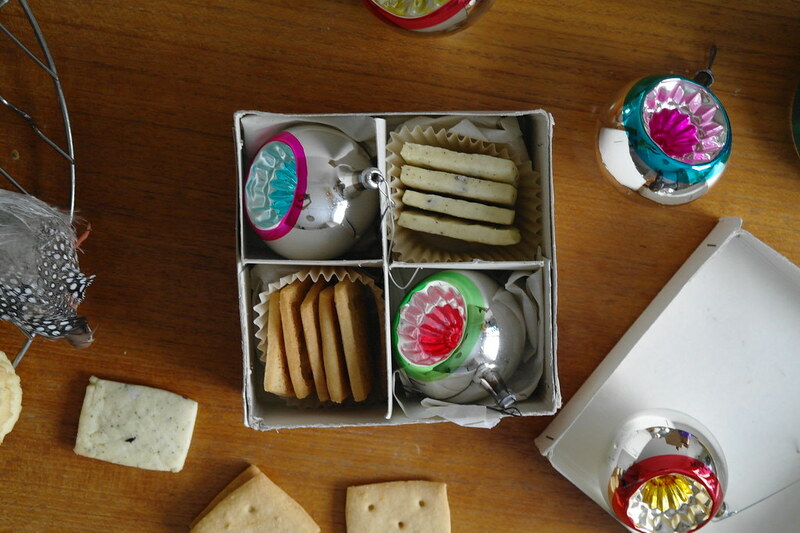 Nevertheless, we managed to take some photographs that do not look completely odd (tentimestea note: we tried very hard! I was also very bossy!). This holiday has been very Star Wars filled. I decided to watch the prequel trilogy (at this point I have watched the first two, and will hopefully watch the third one this evening). I also went to watch Star Wars: Episode VIII- The Last Jedi, which was absolutely fantastic. I thought it was so cool, and I am now impatiently waiting for 2019 for the ninth episode to come out. When discussing Star Wars with her, and trying to get her interested, she was questioning what about it was so very interesting. I find that Star Wars is an incredible film series because of its characters. One of my all time favourite characters is C-3PO, because he is quite funny and is very amusing to watch. I also really love the relationship between him and R2-D2. I actually really love all the droids in the films, especially BB-8, because while the other two are very amusing, BB-8 seems to be the most helpful during a battle because he can roll very quickly, and unlike R2-D2, he can go down the stairs (which was very amusing to watch in The Force Awakens). It is also very touching to see BB-8’s connection to his owner, Poe Dameron. I will not spoil the latest film for those of you who have not yet seen it, but I will say that there is a moment in the film where Poe is more interested in seeing if his droid is alright than whether his human friends are. In all fairness, if I had a droid as cute, loyal and helpful as BB-8, I would most likely react the same way. I would also like to have a Wookiee as a friend, like Han Solo and Chewbacca. Not only would he be loyal and helpful for piloting around the galaxy, he would also give very warm, comforting hugs. I have often thought about sleeping next to Chewie and using him as my pillow/blanket. There is so much more that I could say about every single character from the Star Wars franchise, but, since not all you fellow readers of this blog are fans of this series, I do not wish to bore you with a Star Wars rant, since you are here to appreciate the incredible baking that goes on in tentimestea’s kitchen. So, here we go: back to the kitchen. The end result is very delicious. The pastry is reasonably flaky and the filling is very apple and cinnamon tasting. However, that part is slightly shocking to me considering all the ingredients that we put into the apples (tentimestea note: too much cinnamon I think). 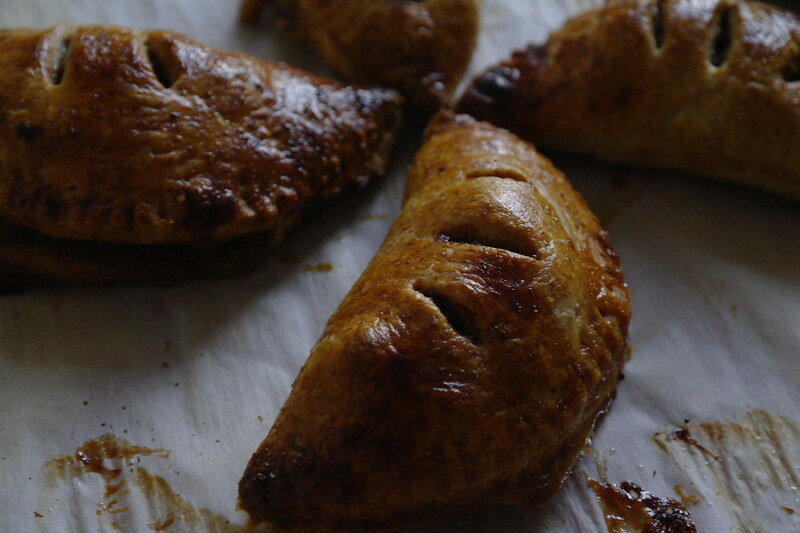 I would advise that if the turnovers are not eaten almost immediately after taking them out of oven, to put them into the toaster oven to crisp the pastry and make the apples warmer (I also think that this would go very well with vanilla ice-cream, when warm). Thank you The Cousin! You can find more of her writing and photography at the Writographer. My aunt, uncle and The Cousin were sweet enough to buy me some spices for baking with, which included cardamom and a few new ones to me, such as the pit of the sapote fruit. At the spice store they were advised it could be used like nutmeg. At first I could find little other information on the sapote pit (as opposed to the fruit) apart from this Chowhound thread started by a person who purchased the pit from the same place and received the same advice. After a bit more searching I realized the mamey sapote pit is also referred to as pixtli and used, for example, in mole. The sapote pit (pixtli) does has some nutmeg-y tones, but is milder and less spicy, with some nuttiness and a more cinnamon-type toastiness. Next I’m thinking I will try it in something with cream and maybe chocolate, similar to what I saw in this cookbook. Overall, these turnovers were alright. Nothing exceptional, but simple, straightforwards: just pastry and cooked apples–or really, whatever sort of fruit or jam or nut cream you like. Pastry methodology, as most often always, adapted from Chez Pim’s pie dough. For the pastry, combine the flour with the sugar and salt and pour out onto the counter. Cut the butter into thin slabs, dust both sides in the flour. Using the heel of your hand, flatten the butter into the flour. 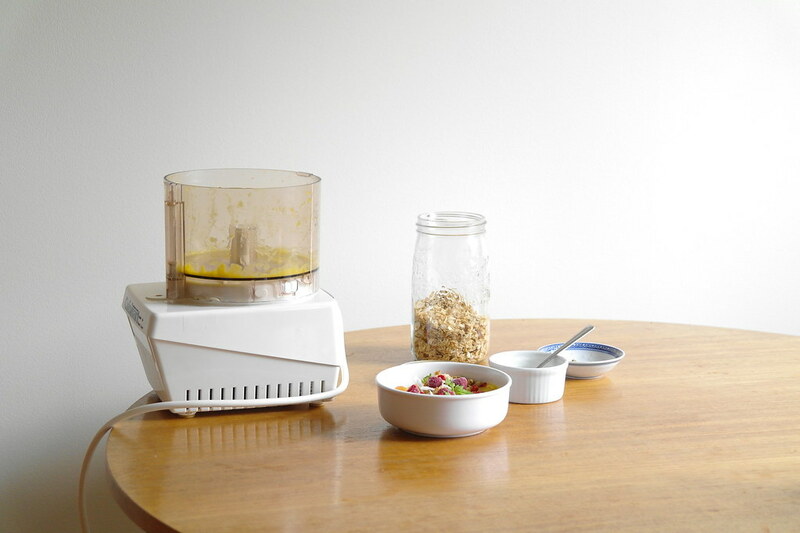 Use a bench scraper to turn the flour/butter over onto itself and flatten again. Repeat until the butter is in thin flakes. Make a well in the centre, add a couple tbsp cold water, adding more as necessary, and mix by the same folding method until you have a shaggy cohesive dough. Roll out into a rectangle, fold in thirds, then roll out in the other direction and fold once more. Wrap in plastic and chill completely. For the filling, place the peeled and chopped apples in a small saucepan, add the sugar, spices, rum, and cook until the apples are just tender. Let cool. Roll out the pastry thinly and cut out rounds. Roll the rounds out a bit thinner if necessary–the smaller the rounds are, the less filling you can fit into them. Pile the filling in the middle (1 1/2 -2 tbsp depending on the size of the round). Brush the edge with a bit of water and close, then seal with a fork. Score a few vents into the top, brush with beaten egg and bake until well browned, around 20-30 minutes depending on the size and thickness of pastry. As the Cousin suggests, they are better warm. There’s usually been some sort of cookie effort each winter holiday, overambitious at the outset, quite modest by the end, and nothing like the fabled concerted undertaking of my grandmother. As my dad describes, the holidays always necessitated the tart-shaped sandkaker, rolled ginger cookies and the small buttery mounds filled with a dollop of jam. On the other hand, my mum’s only requirement for the holiday cookie spread was tart lemon bars, while my sister would take the lead on any supplementary baking. My sole contribution began in elementary school when, pouring over the enticing glossy photo spreads from a Company’s Coming cookie book, I became enamoured with the swirled icebox cookies–the perfect slices reminded me of the hidden designs in Pillsbury slice and bake cookies. More recently, Bouchon Bakery‘s speculoos have become the lemon bars’ (the one constant) companion. This year, I was thinking of what I could do for my lab and realized that there was an opportunity here. 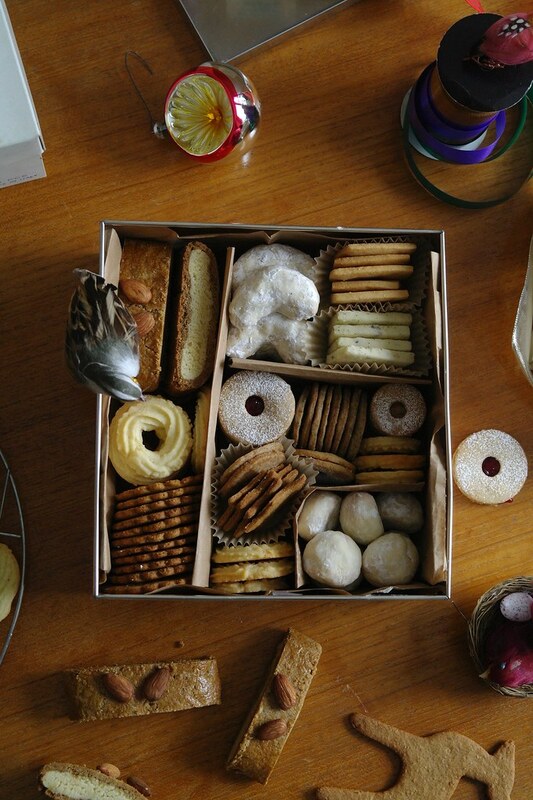 This would be the year, I decided, where I would make all my haunting and unfulfilled cookie dreams come true through The Workplace Cookie Box. 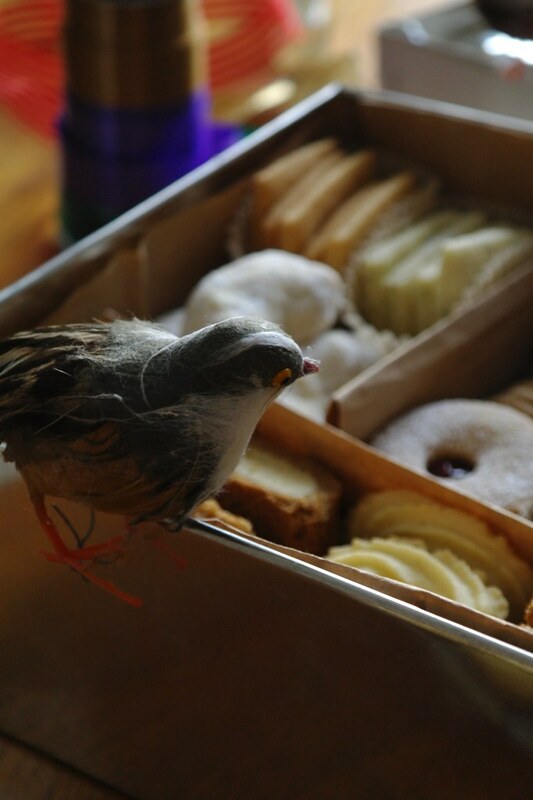 Over the course of a few pre-dawn baking sessions, I put together a box for the lab. 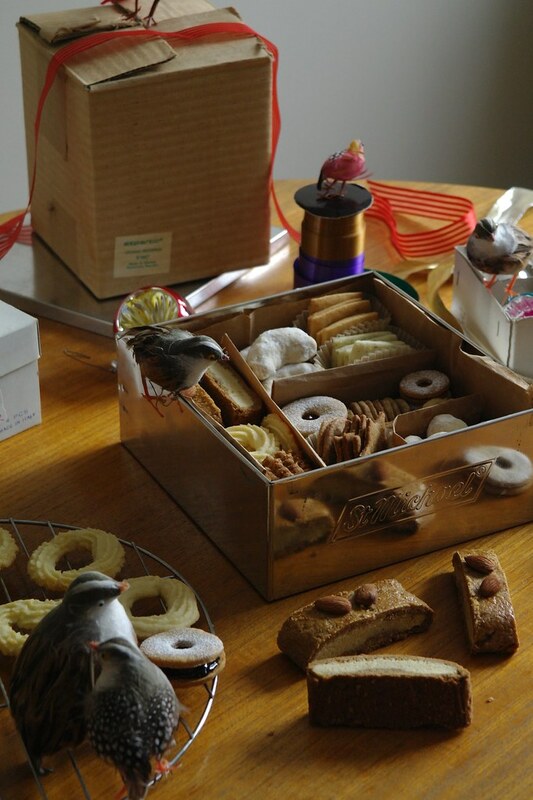 Quite a few of the recipes are drawn and adapted from Beatrice Ojakangas’s Scandinavian Baking, while others were previous favourites (linzer and cookies rolled in icing sugar) and others I had meant to try to make for a while (kinako shortbread and gevulde speculaas ). It was certainly a lot of butter, but any concerns easily justified away because it and all the sugar were to be diluted over many people. They’re all cookies of the more dry and crumbly sort–which also travel the best, last longer, and aren’t likely to dry out. There are some classics–jewel-toned linzer cookies are perfect on the second day and the vanilla wreathes, while a pain, are actually possible to pipe (some tips included in the recipe). The ginger cookies are a bit spicy and so very, very numerous. It’s a robust dough–it only gets smoother after being rolled out multiple times, and they’re baked so thin and crisp that there is no worry about toughness. As shortbread are so amenable to a variety of flavours, I made a couple variations, one with kinako (which were simple, sandy, and subtly nutty) and one with black tea and rose (which could have used a bit more of both flavours). 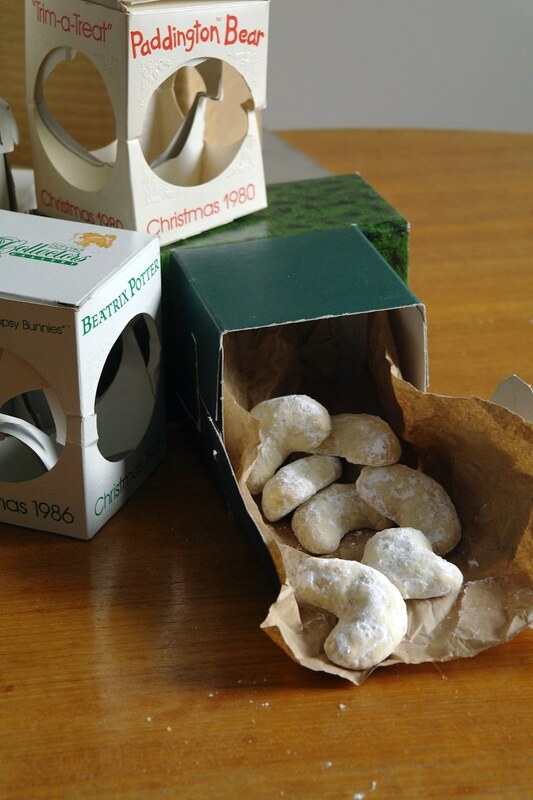 While the floral orange blossom snowballs were fun, my favourite cookie was the crescent-shaped walnut and anise cookies. I find them really fun, with a strong assertive anise flavour right at the outset. Otherwise, the rye cookies, which I knew I wanted to like but wasn’t sure I actually would, were surprising delicious as well. Finally, the gevulde speculaas stand out a bit in the box due to their heft, but they’re delicious, mostly solid marzipan and spices. See here; for filling used strained cloudberry jam, ligonberry jam and black cherry jam (for a fun array of colours). I love the cookies themselves! 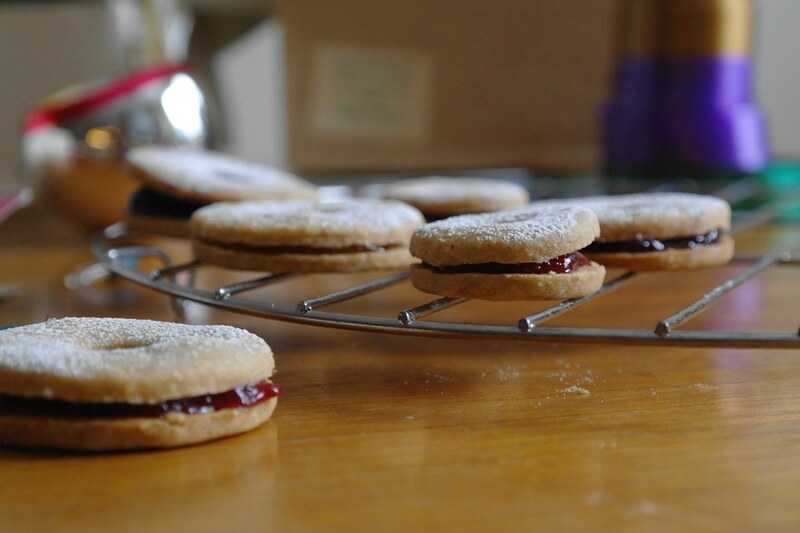 They’re delicate, crumble easily, and delicious…and luckily they are also wonderful when sandwiched with jam. Adapted from Beatrice Ojakangas’s Scandinavian Baking. Makes a lot of cookies! They are pretty much just like the orange and ginger cookies from the supermarket–thin and crunchy. Cream butter with sugar, then mix in the egg, orange zest, and rum until smooth. Separately, combine the remaining ingredients, then add to the butter and mix until you have a soft cohesive dough. Give it a few kneads until it is smooth. Pat into a round, wrap in plastic, and chill completely. Roll out thinly on a floured surface to around 1/8″ thick. Cut out cookies, place on a parchment lined baking sheet, and bake until beginning to brown around the edges, around 8-10 minutes. They’re really delicate and have a good little bit of flavour thanks to the rye flour. From Beatrice Ojakangas’s Scandinavian Baking. Makes around 28 small cookies. Cream the butter with the sugar, then mix in the rye flour followed by the remaining ingredients, and lastly mix in the water. I was not convinced that the water was necessary, nor that it needed to be added where it did, at the very end–I’ll look into this again. Pat dough into a round, wrap, and chill completely. Preheat oven to 375F. Roll out very thinly, ~1/8″ thick. 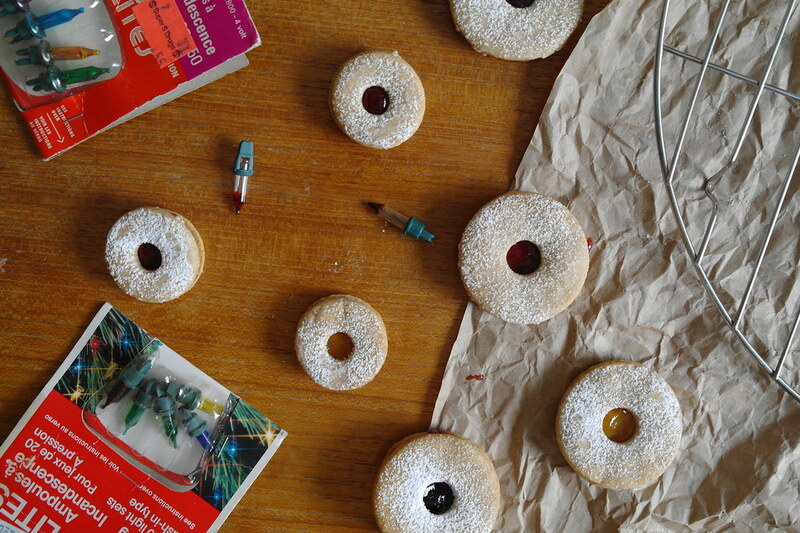 Cut into 5-cm rounds, cut a small 1 cm hole from the centre of each and prick all over with a fork to make you ragkakor cookies look like ragkakor bread. Place on a lined sheet tray and bake for 10 minutes or until beginning to turn golden on the edges. My favourite of the cookie batch due to their assertive flavour. Adapted from the almond crescent cookies by An Italian in My Kitchen. Makes around 24 medium-sized cookies. Cream the butter and sugar together, then mix in the nuts, salt, anise and finally the flour. Chill dough. Preheat oven to 375F. Roll into crescent shapes; I made 24 cookies that were ~16g each and baked for 17 minutes or until beginning to brown. But they expanded more in the oven than I expected–so smaller would be also be nice. 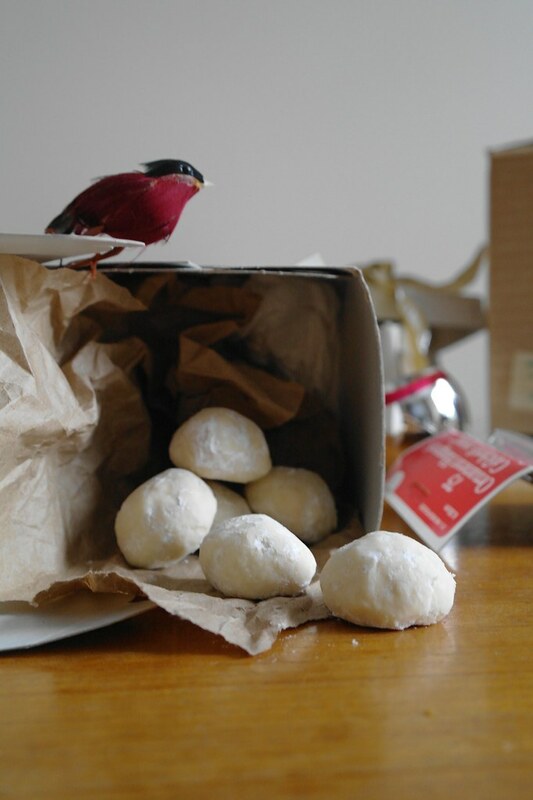 Roll in icing sugar while still warm, and then once more when they are cool. Based on the 3:2:1 ratio for shortbread. Makes 20 small biscuits. Cream the butter and sugar, then mix in the tea, rose, salt and flour. Between sheets of parchment, roll out into a rectangle around 18x14cm and 1/4″ thick and chill completely. Preheat oven to 375F. Cut into rectangles (dividing into 5 along the width and 4 along the length). Space apart on a parchment lined tray and bake for around 10 minutes or until just a bit golden on the bottoms. Subtle, but a bit nutty. Based on the 3:2:1 ratio for shortbread. 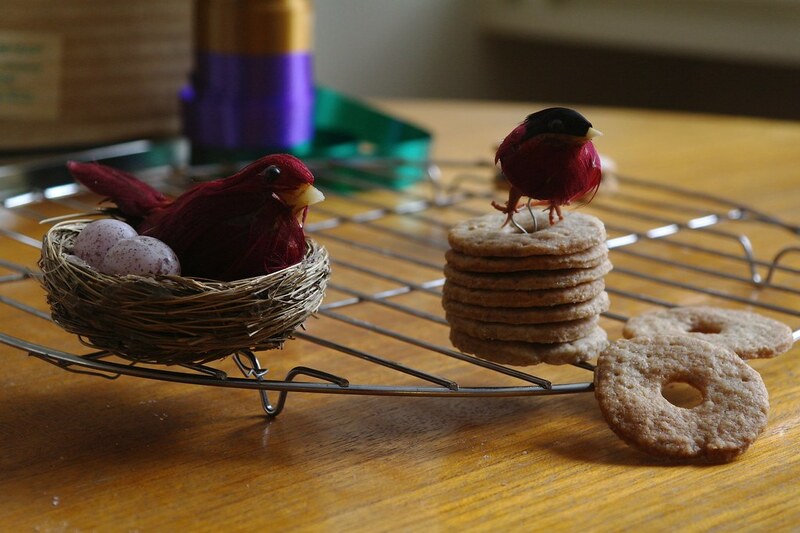 Makes 25 small biscuits. Cream the butter with the sugar, then add the salt and kinako, and lastly, the flour. Between two sheets of parchment, roll out a bit thinner than the rose tea shortbread above, to a rectangle 18 by 22 cm, and chill completely. Preheat the oven to 375F. Cut into 25 rectangles, diving each dimension by 5. 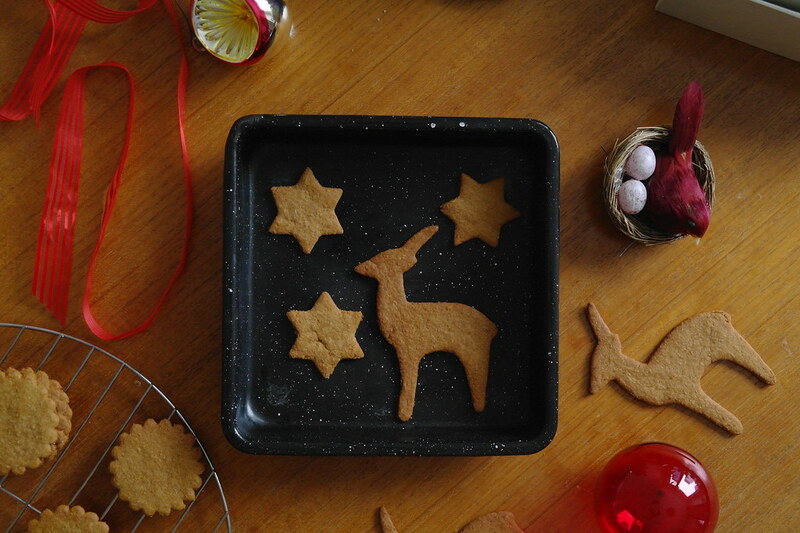 Spread out the cookies on a parchment-lined sheet tray. Poke with the blunt end of a wooden skewer for a pointless but cute either three or five dot pattern and bake for 10 minutes. Adapted from the almond crescent cookies by An Italian in My Kitchen. Makes around 25 small cookies. Cream the butter with the honey, sugar, vanilla extract and water. Mix in the ground almonds and flour and chill dough. Preheat the oven to 375F. Divide the dough into small walnut/large hazelnut (13-14g) portions and rolled them into small balls. Place on a parchment-lined sheet pan and bake until lightly browned on the bottom, around 10 minutes. Roll in icing sugar while still warm and then once more again once cool. 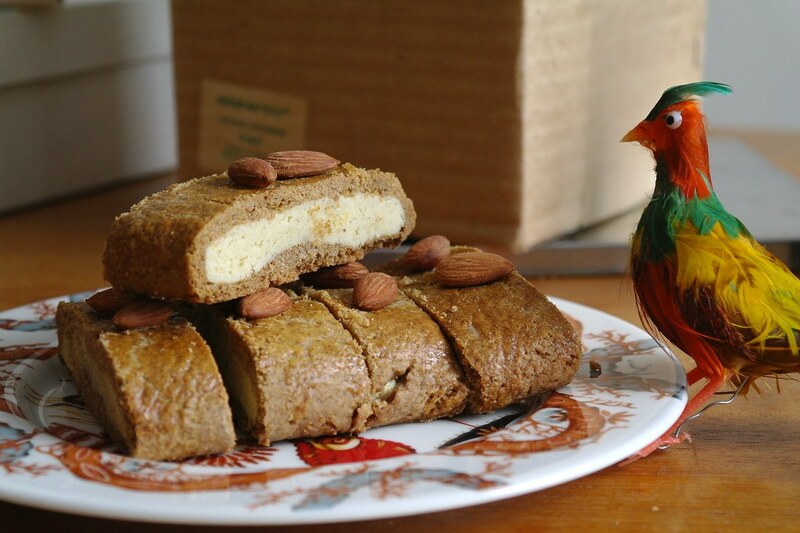 From Nordic Food & Living and Beatrice Ojakangas’s Scandinavian Baking. They’re pretty wonderful! Cream the butter with the sugar. Mix in the seeds scraped from the vanilla bean and extract, then the salt and ground almonds, and finally the flour. Chill the dough briefly, just to bring down the temperature a little, but not to harden it, then transfer to a piping bag fitted with a large star tip. I used a stitched piping bag to bypass the fear of the bag bursting open (which has certainly happened before, such as with chunky chestnut puree). Then pipe rounds, around 3″ in circumference, on a parchment lined baking sheet. I found it much easier to pipe when the dough was closer to room temperature as opposed to fully chilled. Chill the cookies fully before baking. Based on the gevulde speculaas from Koken in de Brouwerij and the recipe in Sweet by Yotam Ottolenghi & Helen Goh. It makes for a good substantial breakfast slice with coffee. These ones should be stored in an airtight container to keep the marzipan soft, and if they’re going to be stored a long term, preferably on their own. spice mix: I direct you to Koken in de Brouwerij for a speculaas spice formula. This is just in a general a fantastic post; the blogger also acknowledges that Dutch spice mix came to by way of violence and colonization. It does start to feel a bit complicated when you realize so many rather delicious foods carry such a legacy with them. To make the dough, cream the butter, sugar and milk. Whisk together the remaining ingredients, add to the butter, and mix until you have a cohesive dough, adding a bit more milk if necessary. Knead a few times to ensure the dough is malleable and smooth. Chill. 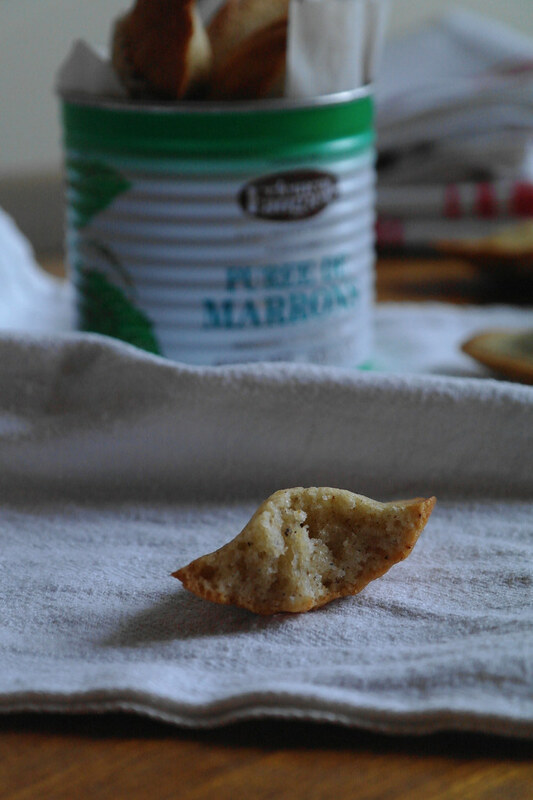 To make the marzipan, combine the sugar and ground almonds in the bowl of a food processor and process a bit to ensure everything is quite fine. Add the remaining ingredients and process until a ball is formed. Roll out dough on a sheet of parchment paper to around 38 by 24 cm. 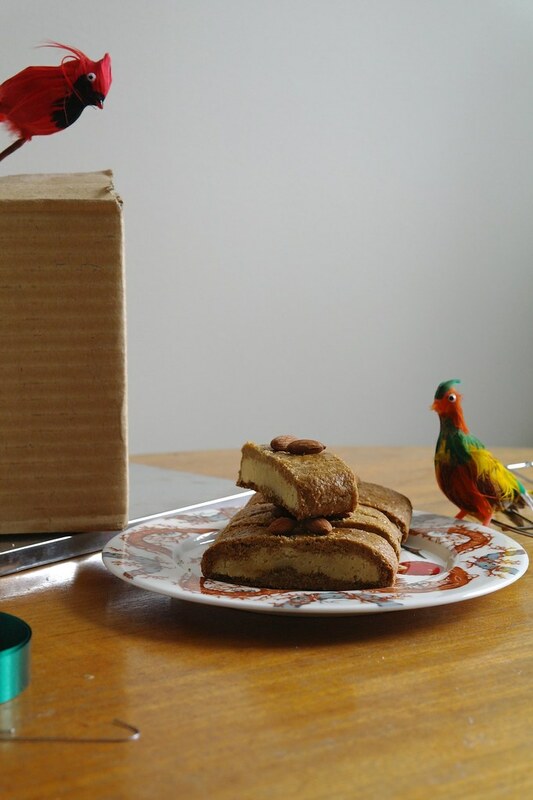 Flatten the marzipan on top along the length of the dough in a strip around 1.5-2″ wide. Wrap the flaps of dough around the marzipan so that they overlap a bit and completely envelope the marzipan, it’s easiest to do this by lifting up the parchment and using that to press the dough against the marzipan. Then flip over the log so that the seam side is down. Brush with a bit of beaten egg and then arrange almonds on top, spacing them evenly to delineate your slices. I arranged the almonds with two in each row for 14 rows. Bake for around 30 minutes or until browned. Let cool completely before slicing into around 14 slices. Store in a sealed container. I overbaked mine a bit as the cookie part was a bit dry, however they were much improved by the second day once the moisture from the marzipan had equilibrated with the speculaas dough.